Spring is finally here and Easter is close behind. Let me “Show You” a quick snack that is a winner with my grandkids. 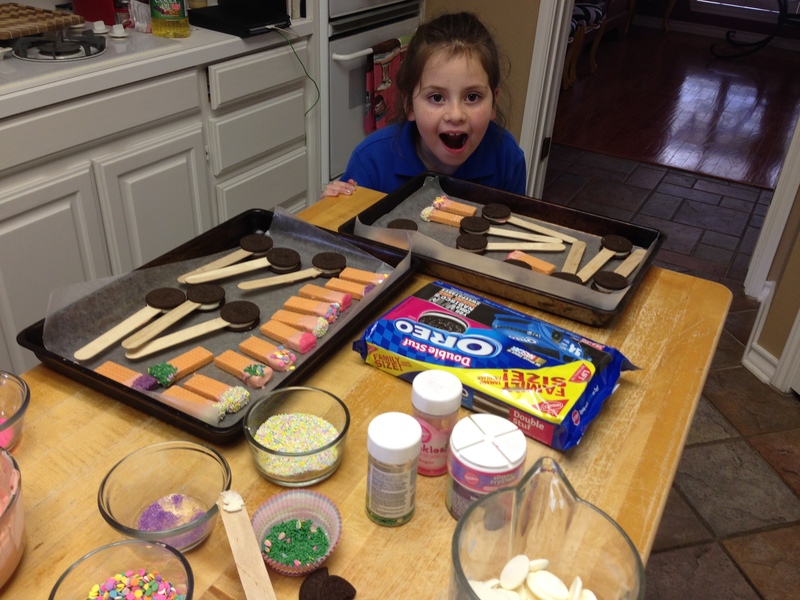 I love to have my grandkids over to make things, either a craft or something fun to eat. On Wednesday nights we go to KSG at Crestview in Midland where they enjoy crafts, bible study, and snacks! The kids take turns bringing the snacks, and this past Wednesday it was their Emma, Ethan, and Noah’s turn. Of course we cannot just take a pre-packaged snack, the kids want to create something! (I wonder where they get that?) They start pulling out the Sprinkles and here we go! You’ll also need lollipop sticks or craft sticks. 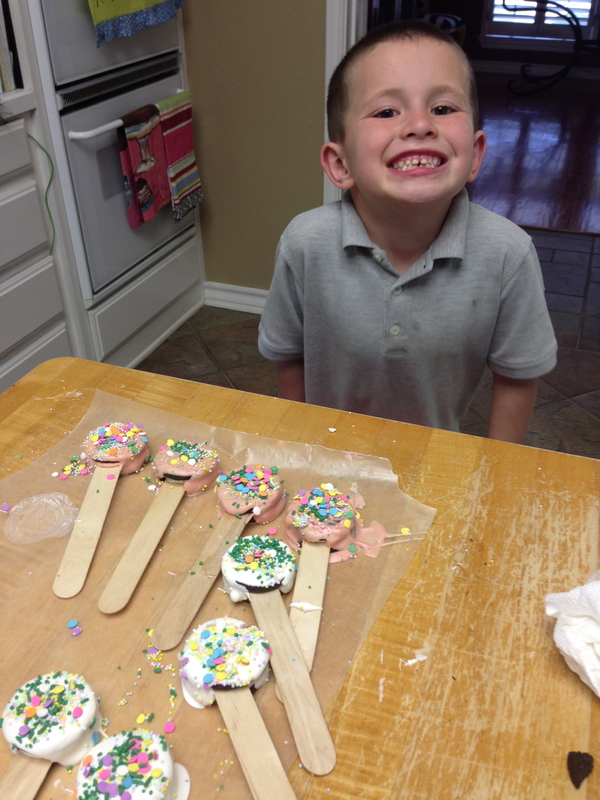 Show me Decorating tip: keep candy melts and sprinkles on hand for a quick and easy food/craft project and everyone is happy! Set up your supplies and get ready for fun and smiles! You can always adjust the color of the candy melts or sprinkles if you have a holiday or special event to celebrate. 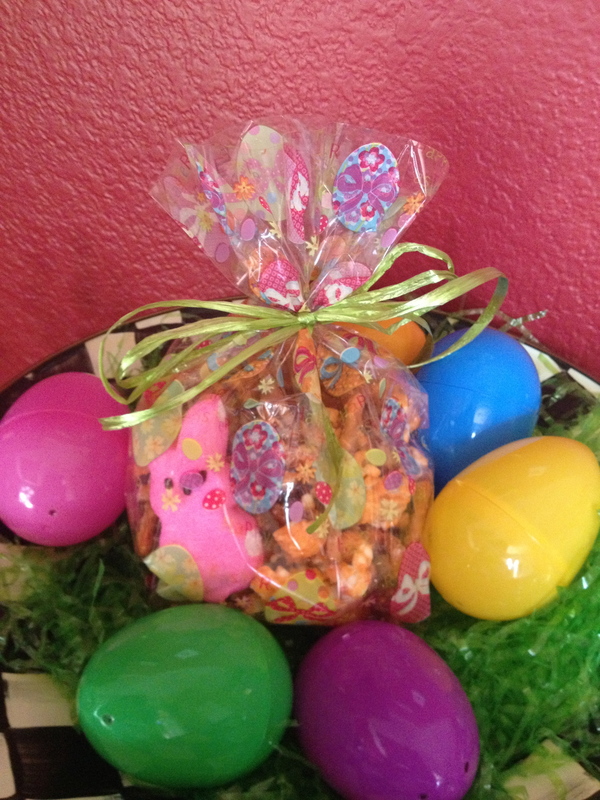 On this occasion we went with spring colors and Easter cello bags for packaging. There are a lot of great ideas on Pinterest for homemade snacks! 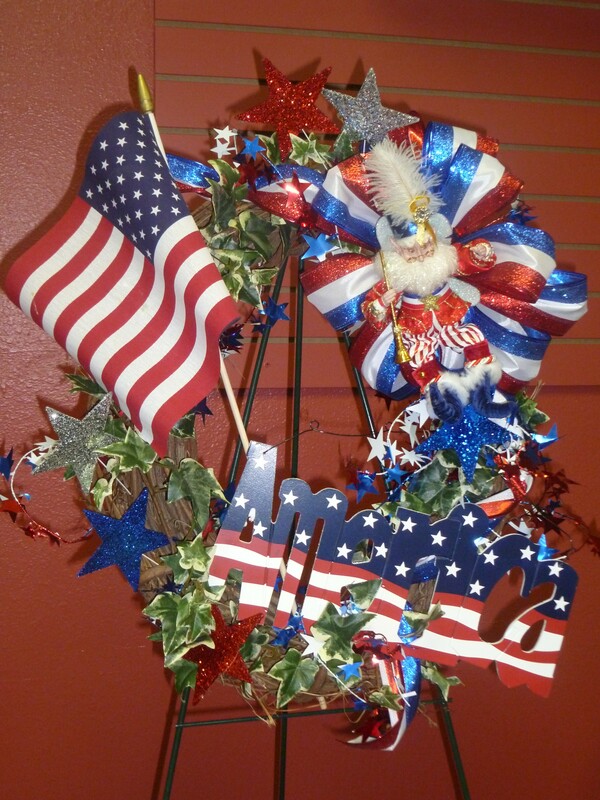 Check out Craft-O-Maniac and Eugenie Kitchen. 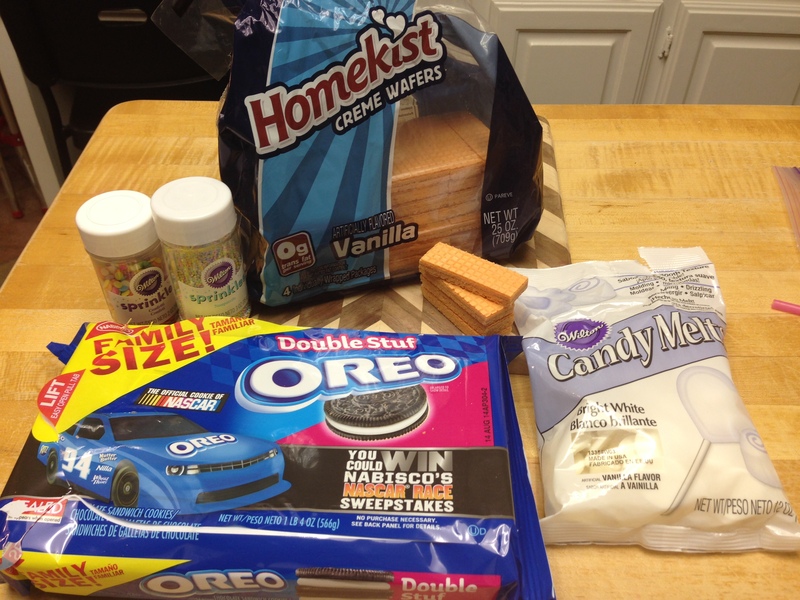 We used Oreos (double stuffed) and craft sticks to create cookie lollipops. 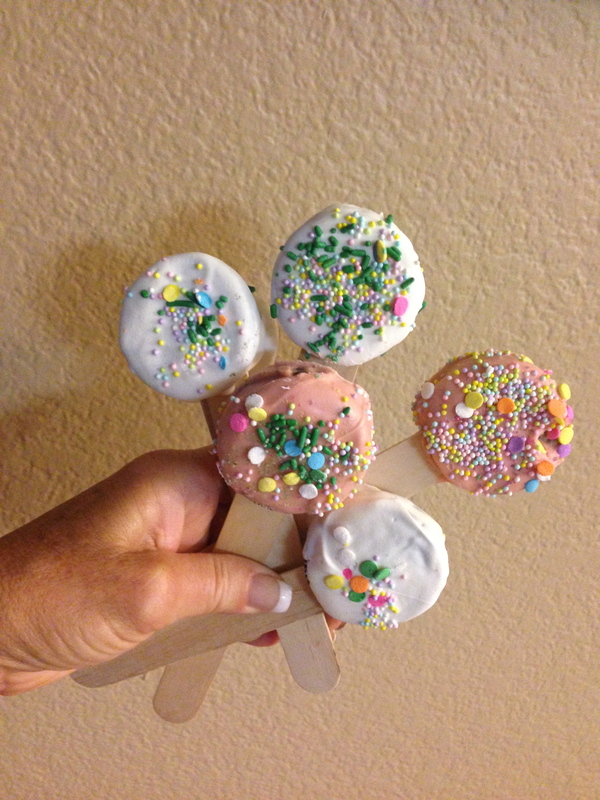 I thought I had the lollipop sticks but Rebecca had used them in making cake pops! 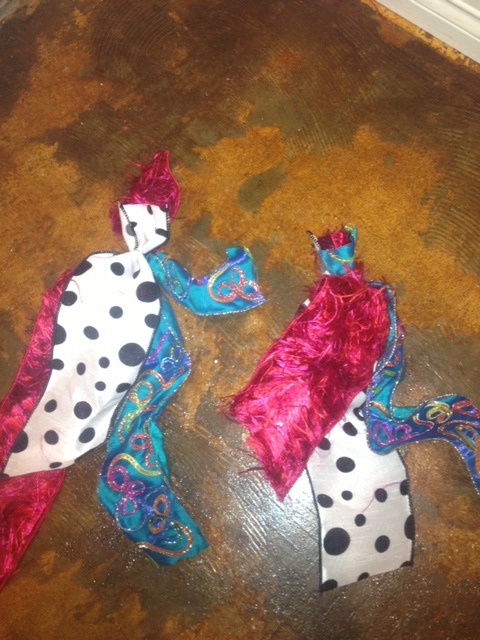 So we improvised with the craft sticks. Noah (3yrs) loves to do it too! We started by separating the cookies, dipping the stick in the candy melt, placing it on the white filling and putting the cookie back together. Allow the cookie to set before dipping and decorating with sprinkles. These goodies create goofy smiles! 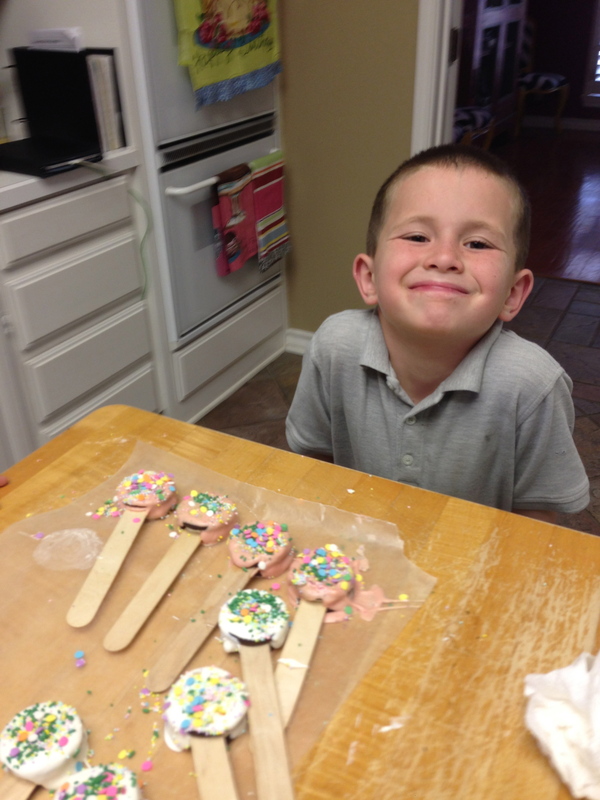 Cookie pops are cute and fun! 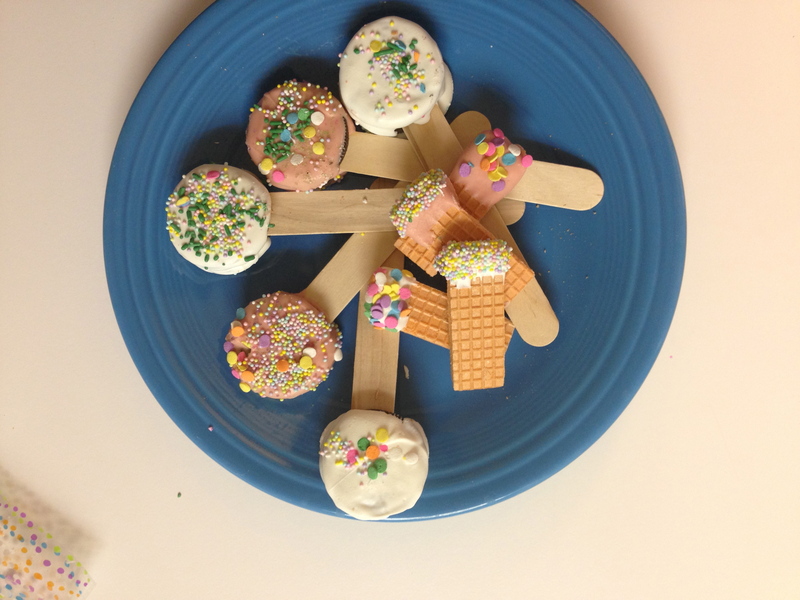 Oreo cookie pops and Sugar wafers are a fun Spring decorated treat! 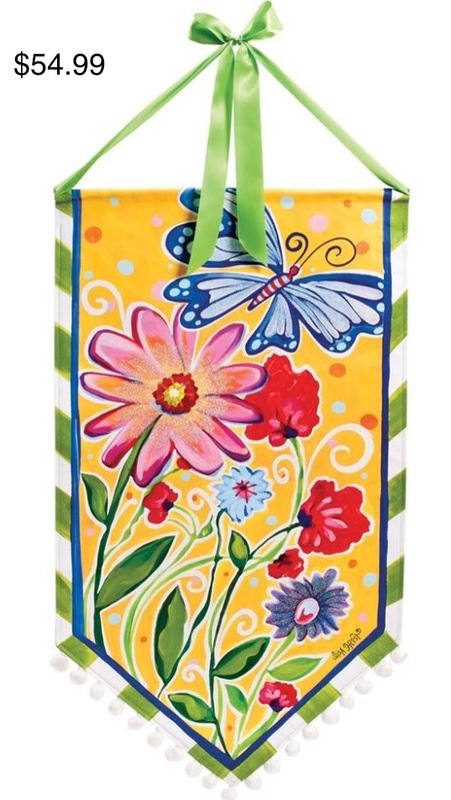 I found these cute Easter cello bags at Walmart. 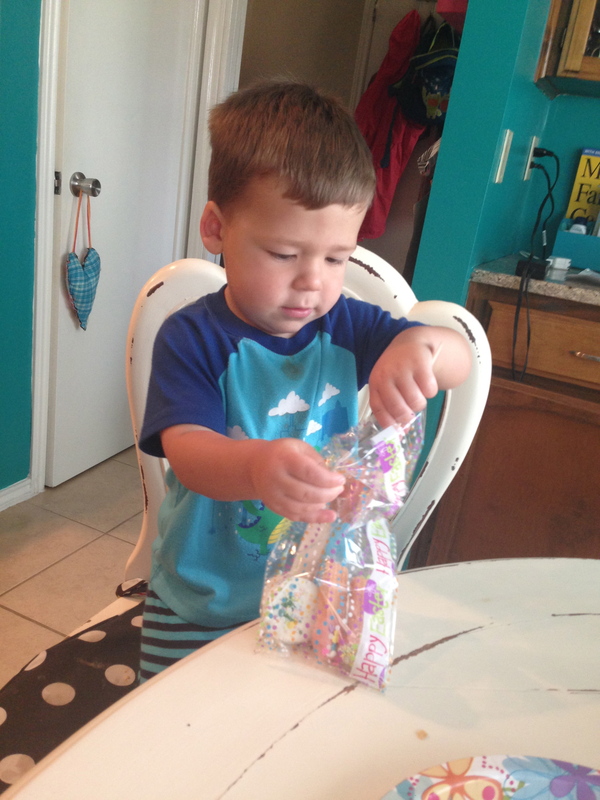 We shared our treats with our friends at church and then took some to cousins in San Antonio. Barret was thrilled with his treat from his cousins! 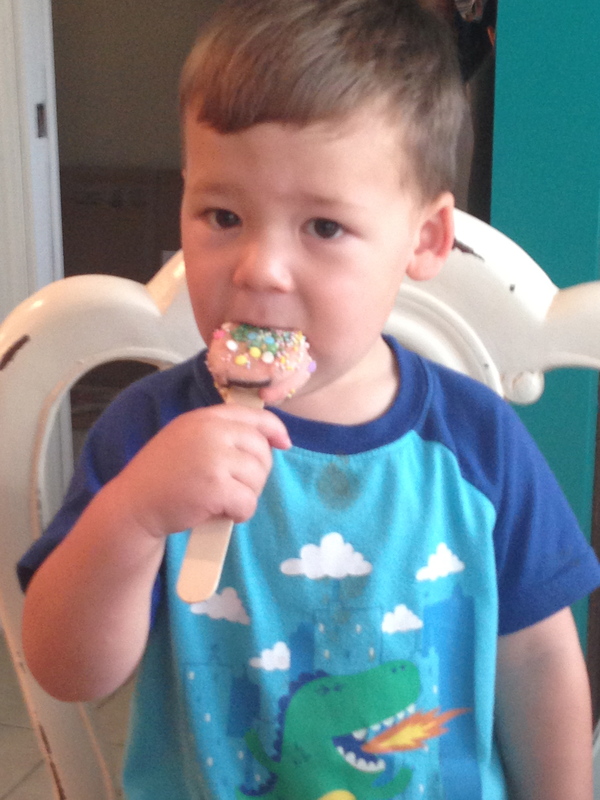 Yummy, just like mom Katy, Barret loves a Oreo anytime of the day! 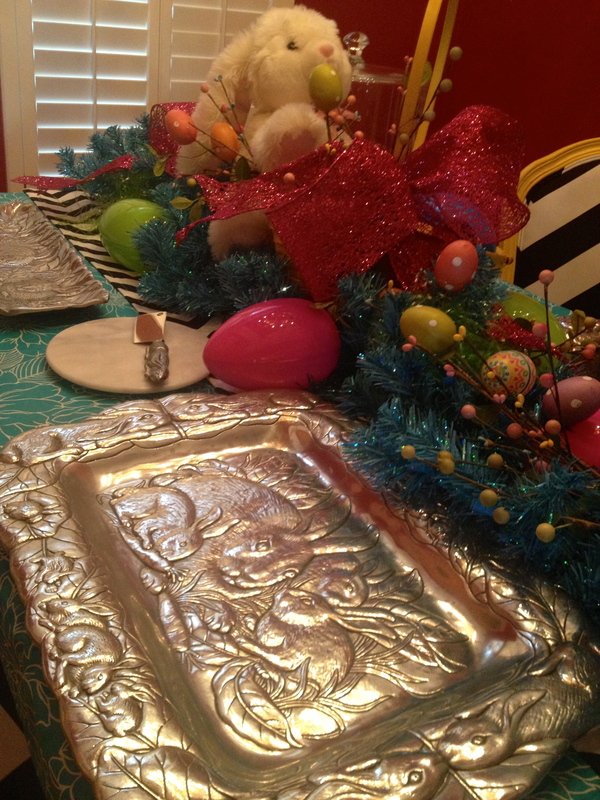 What will you be serving for your Easter celebration? 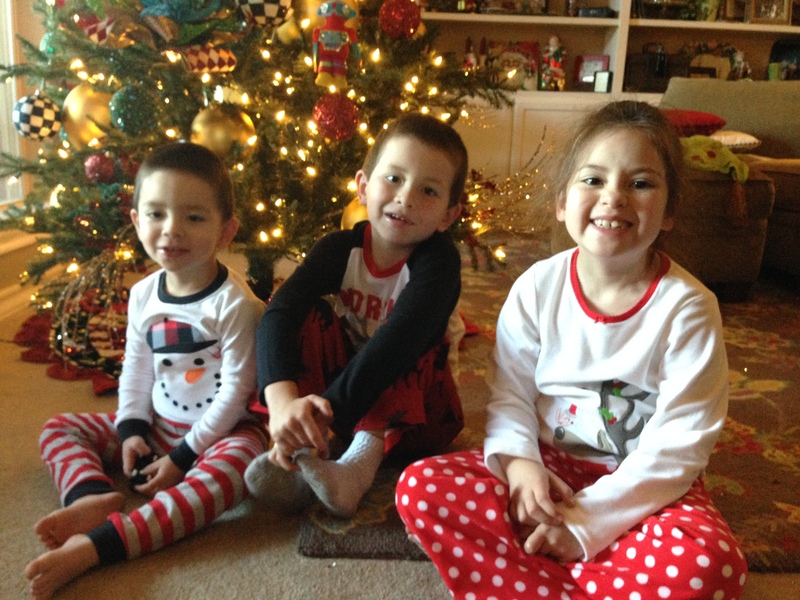 These 3 can be a crazy bunch! 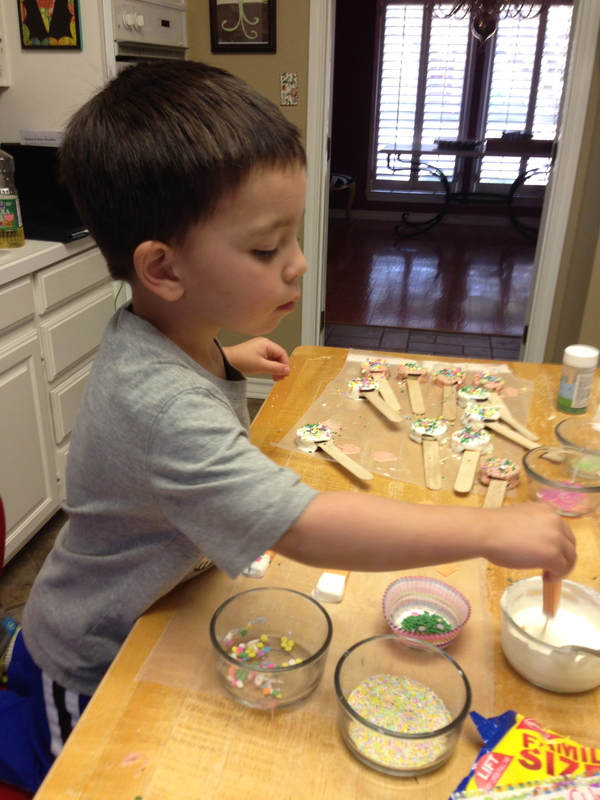 Creating memories is a wonderful opportunity as a Gram, and hands on activities are the best! 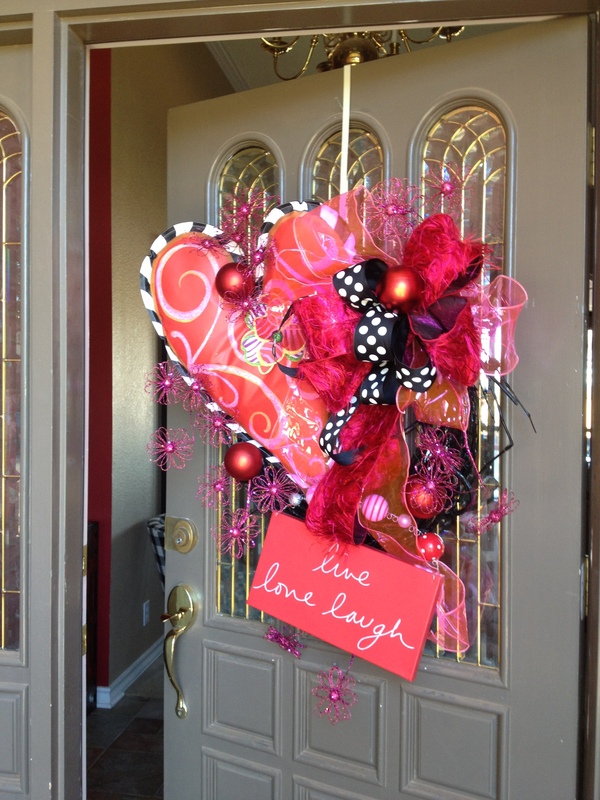 Create Inspire Educate to Decorate! 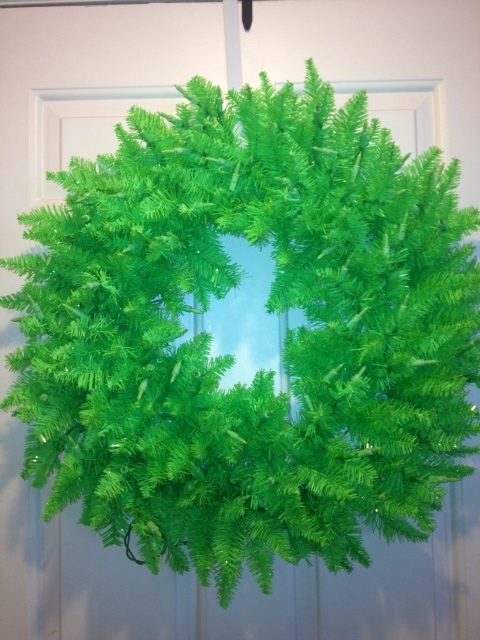 For wreaths, your entryway or for your tabletop! 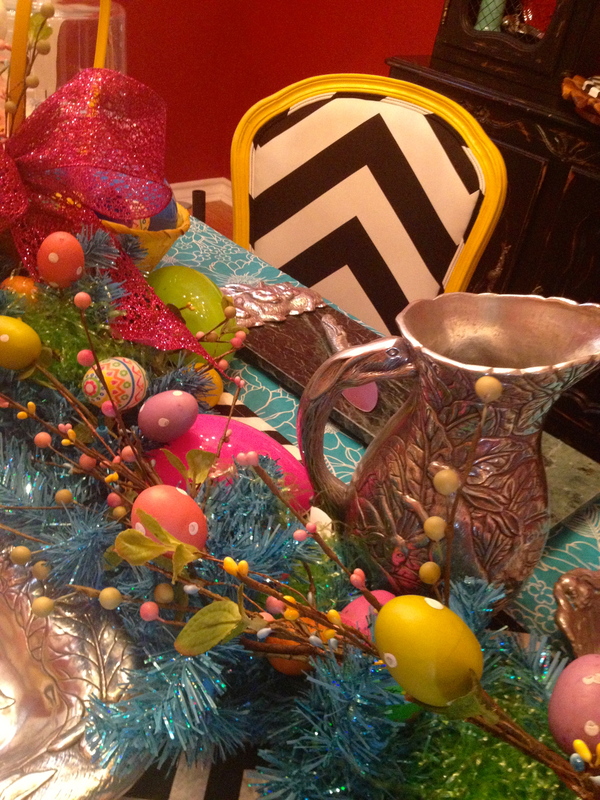 Lisa Frost and Show Me Decorating DIY for Easter! 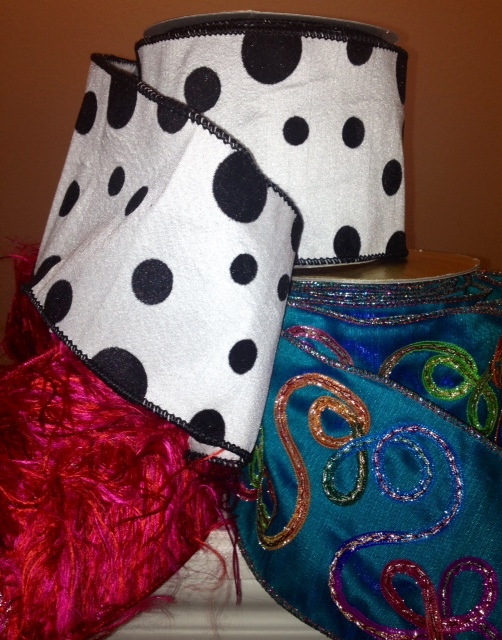 Lisa Frost….talented artist & designer shares her story in art! Her happy heart is translated thru her hands, to her brush and onto the canvas to spread her Frosty cheer throughout the land! 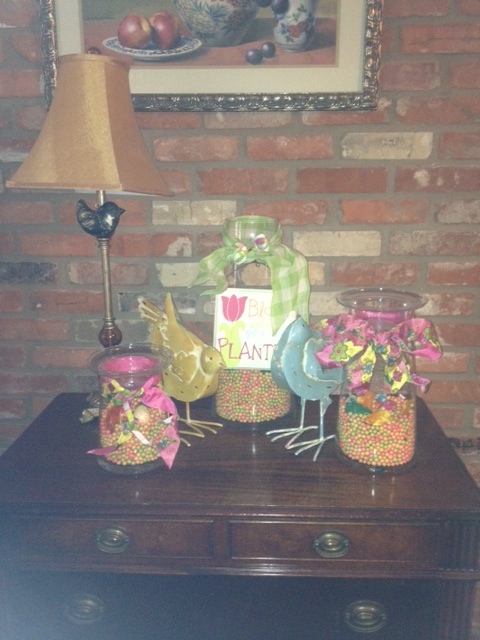 Follow her blog for more DIY Spring and Easter! 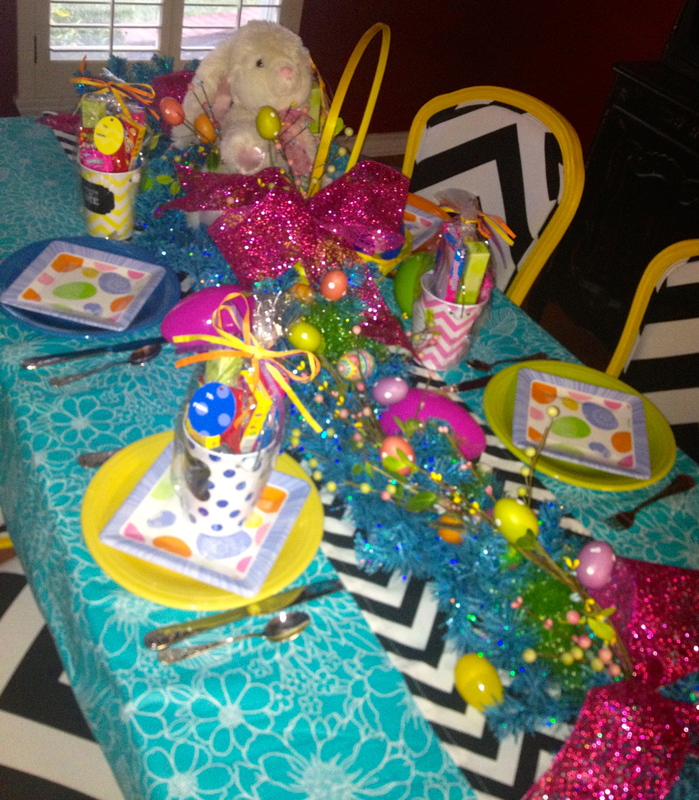 Lisa Frost DIY table for Easter. Her working studio is located in her home for the family to enjoy! I created it by eyeballing the size I would need! I rolled up a piece of poster board and measured the diameter I would need by placing it inside of the glass (that’s what I call “eyeballing”). I noted the space needed for the jelly beans to fill in around it! Marked the size with a pencil. 4. Plugged in my GG…(hot glue gun). Glued the poster board into a cylinder and stuffed the cylinder with florist foam, added the tree branch and stuffed it with newspaper. 5. Set the paper cylinder inside of the glass. 6. Separated the jelly beans by color… 7. Arranged them by color… 8. Layered them inside… 9. Ta-da!!!! 3. Ostrich Eggs with monograms! Thank you Lisa Frost for sharing! 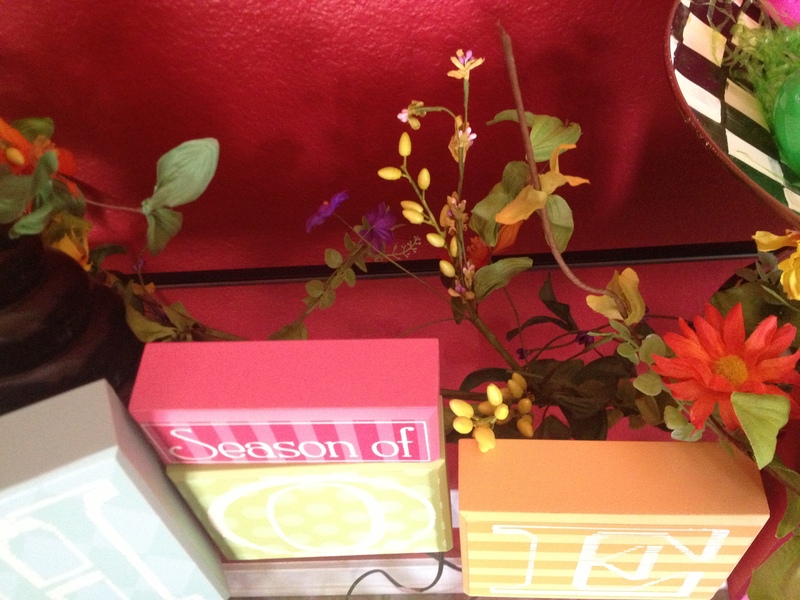 Add a touch of Spring! 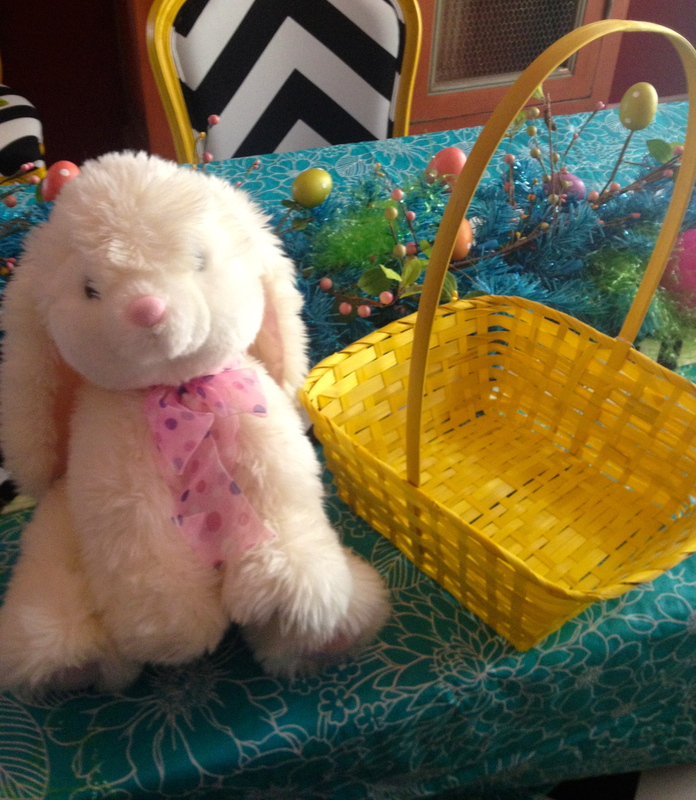 Hop on in…and Celebrate Easter! 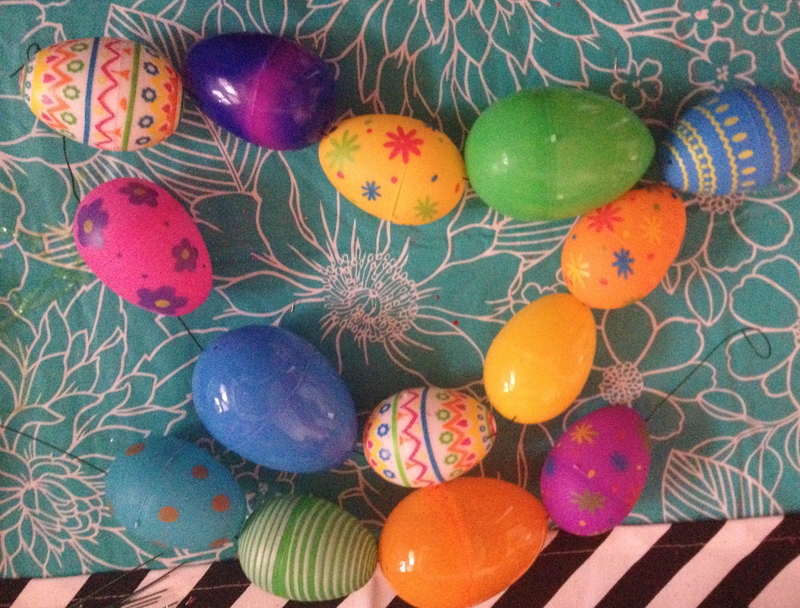 All the Easter Egg hunters welcome! 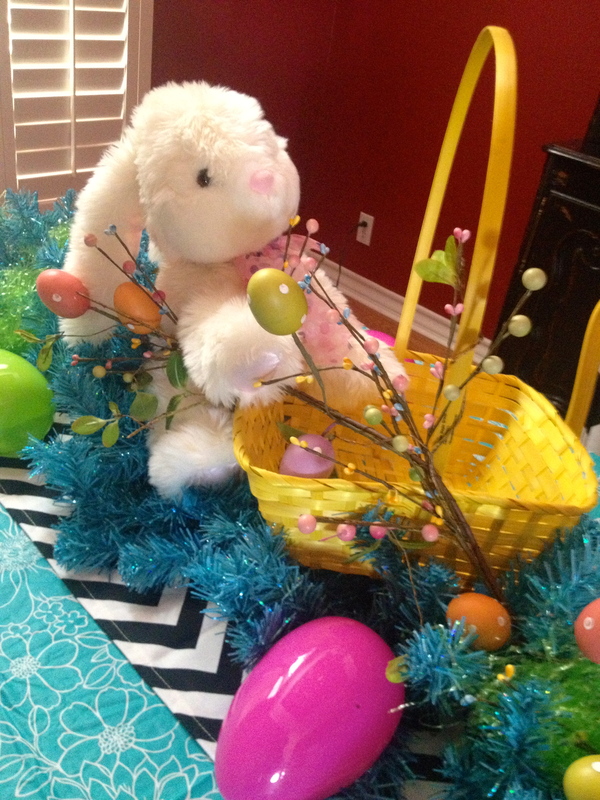 Grab your baskets, ready set, hunt……. 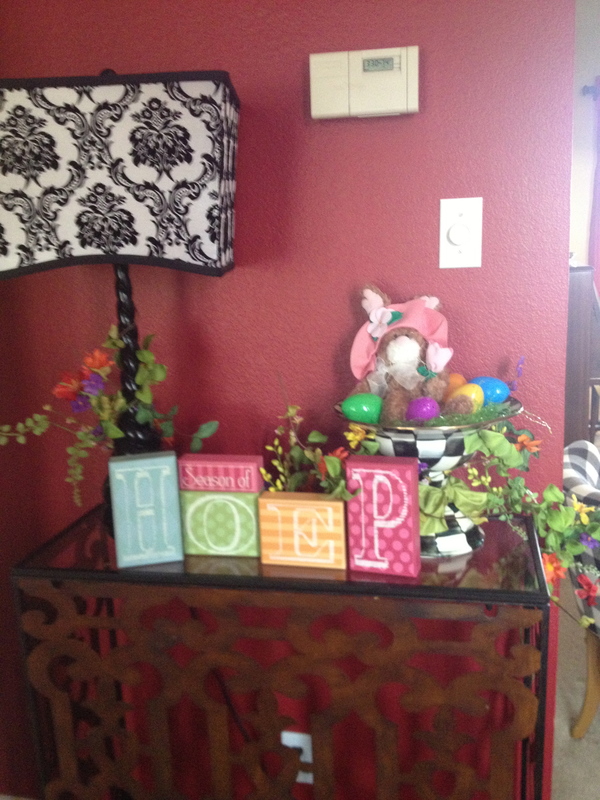 From www.ShowMeDecorating.com 40% Off Select Easter & Spring Through March 22! Hop on in…everyone is welcome! 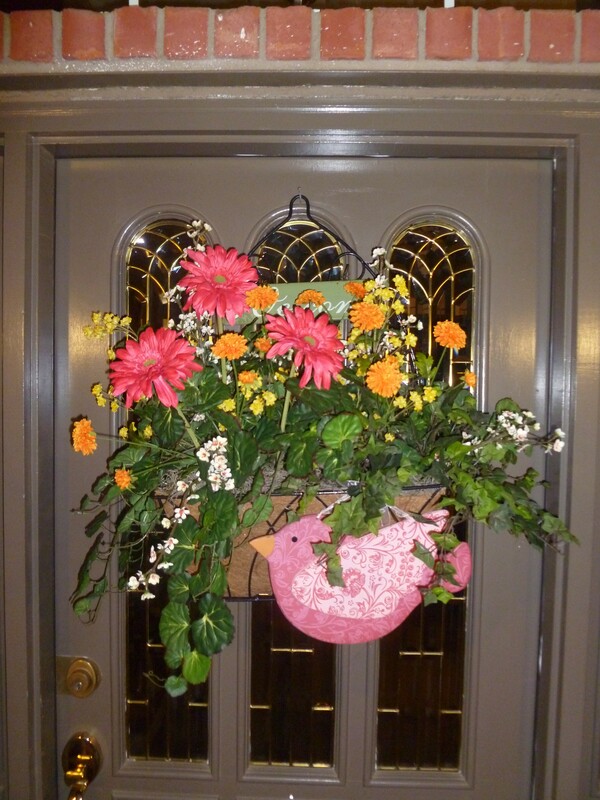 The new online store ShowMeDecorating has a great selection of ingredients to decorate your door or entranceway for Easter and then change out for Spring! Invest in basic key ingredients and get double and even triple use or seasons! 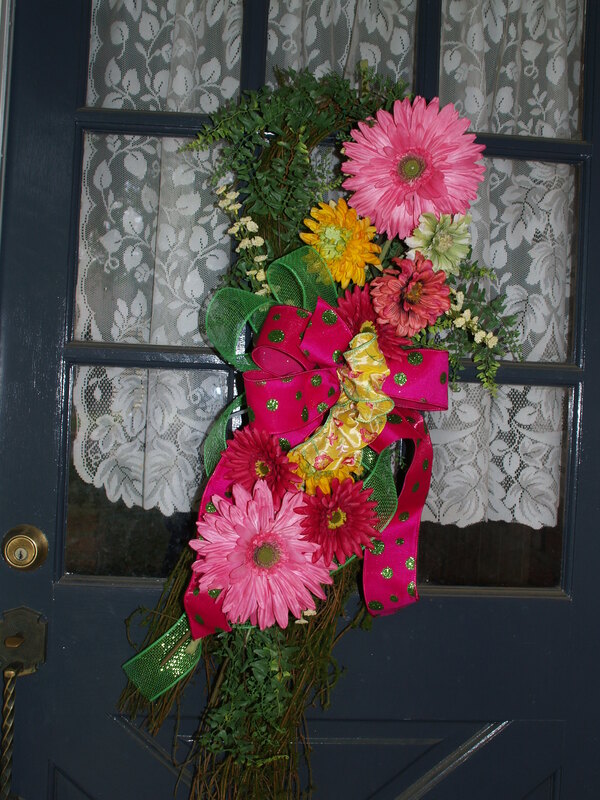 After wrapping the Bright Multi Flower Garland on the wreath, the extra length was left to swag down! 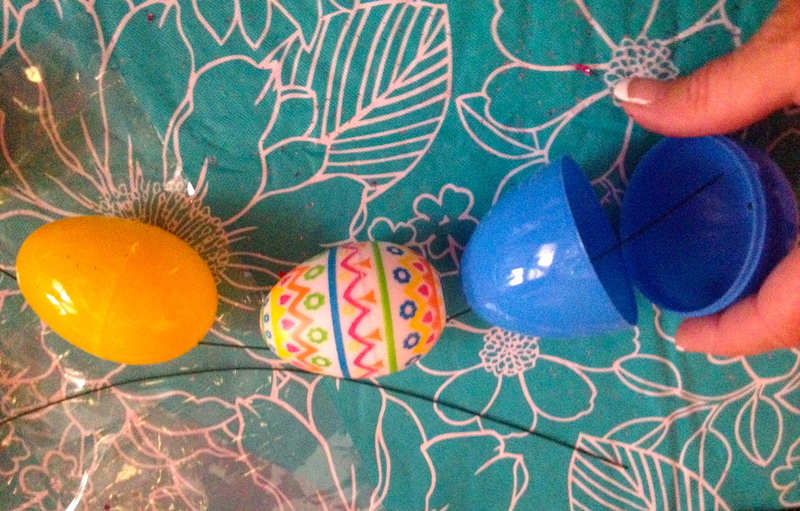 The egg “ribbon” was easy, floral wire threaded through the holes in the plastic eggs, the end of the wire was curled to hold first egg in place and then more eggs added in a variety of color and designs, leave enough wire to attach to your wreath. 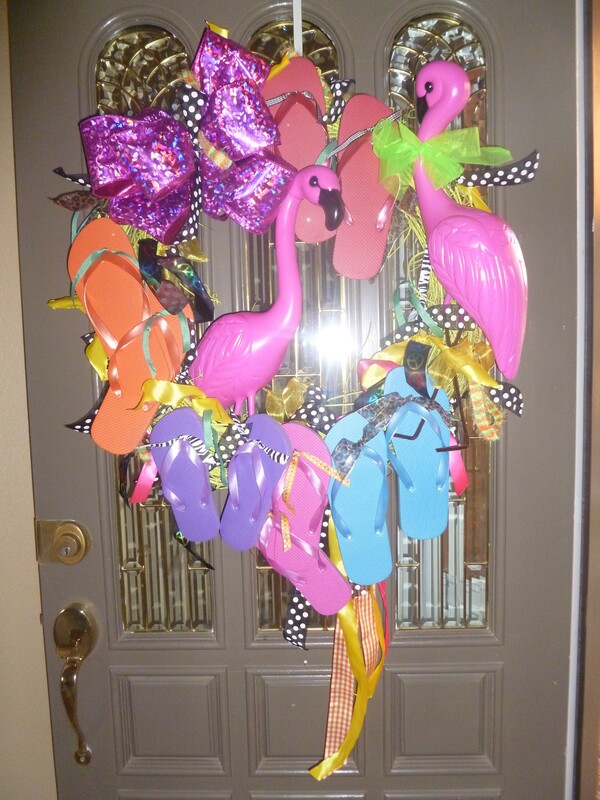 This is fun addition and when I remove the eggs and happy Easter sign I can add a spring sign and flip flops to welcome warmer weather! 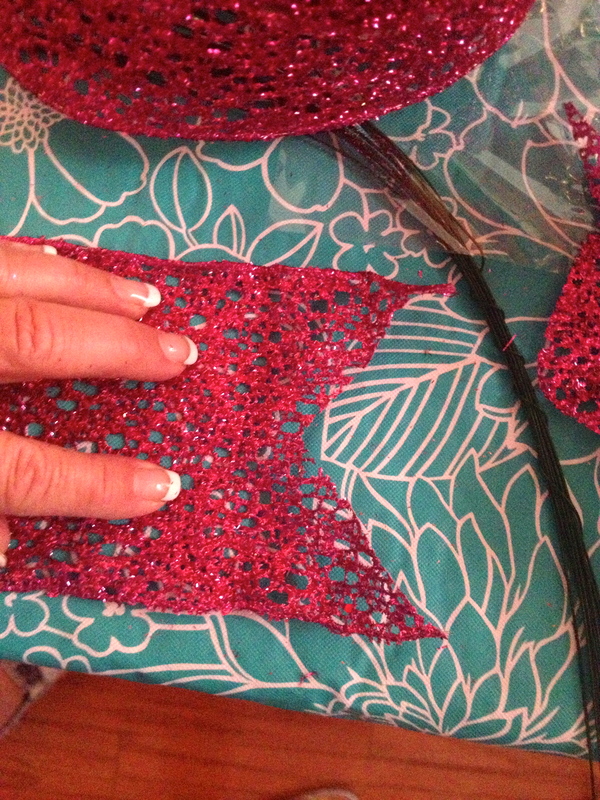 Step 5 Wire on to wreath, or hang from a chandelier or garland or ????? With the left over Ribbon from my 10yd bolt of Pink Glitter Coral Ribbon I tied bows with streamers and added to the base of my Chandelier! 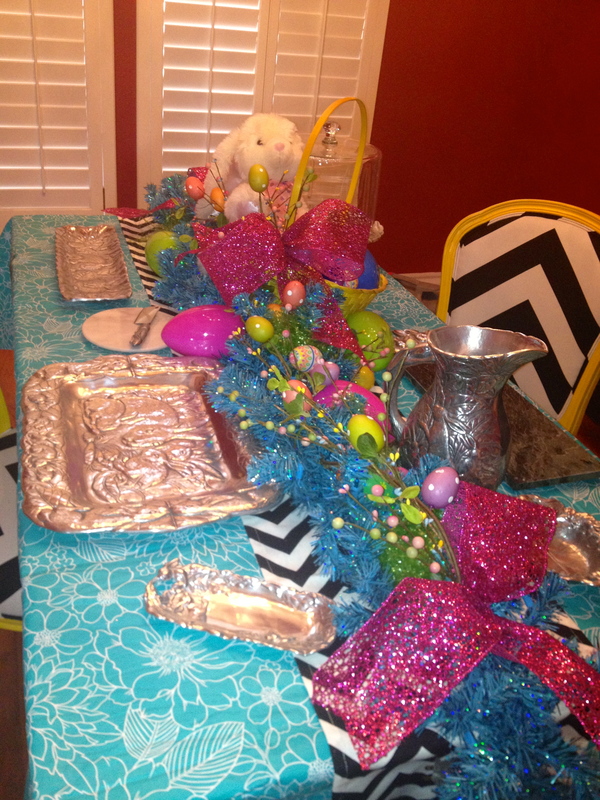 An Egg-stra Special Easter Table ! Are you planning a luncheon, family dinner or Easter feast? A great looking table will complement your wonderful food! 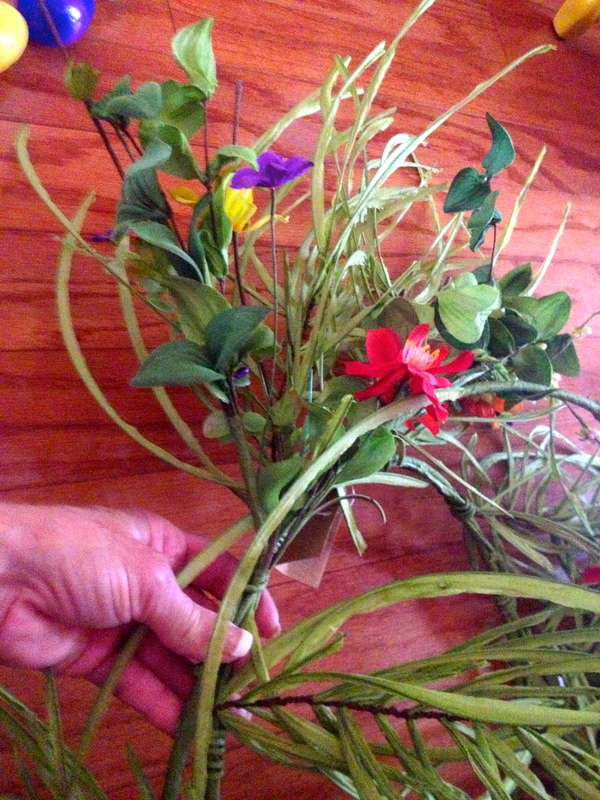 Close up of greenery twisted around Easter garland to secure. 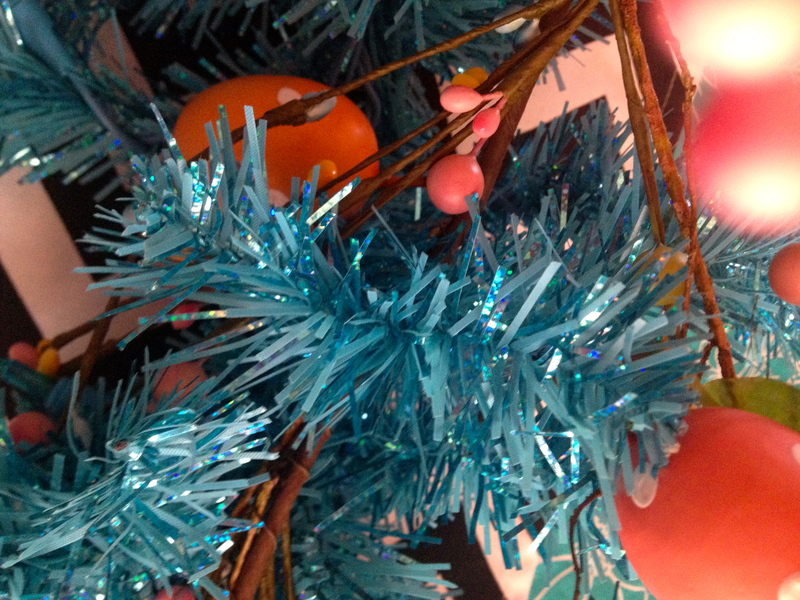 The 9′ garland in Sky blue (from Rebecca’s Christmas decorations) was the base to attach all the fun Easter too. 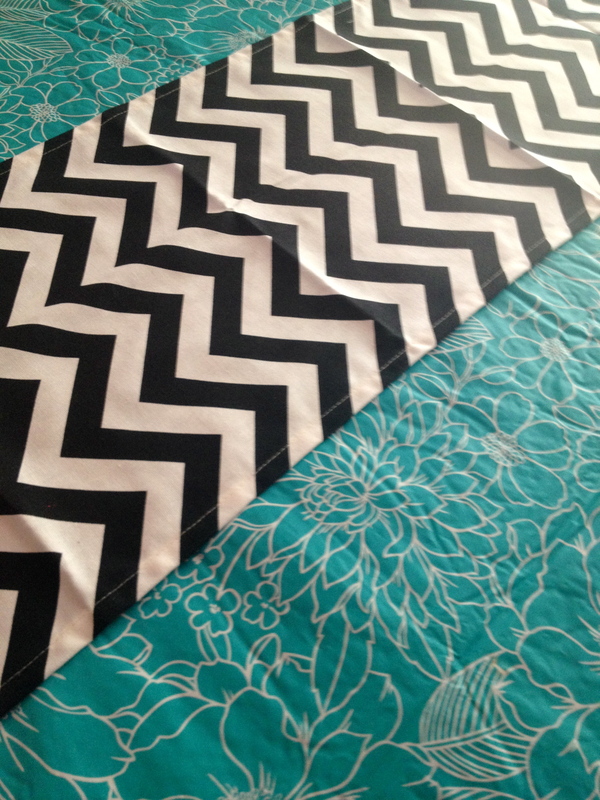 I started by fluffing and shaping it out and placing it down the middle of the table, allowing it to hang over the ends. 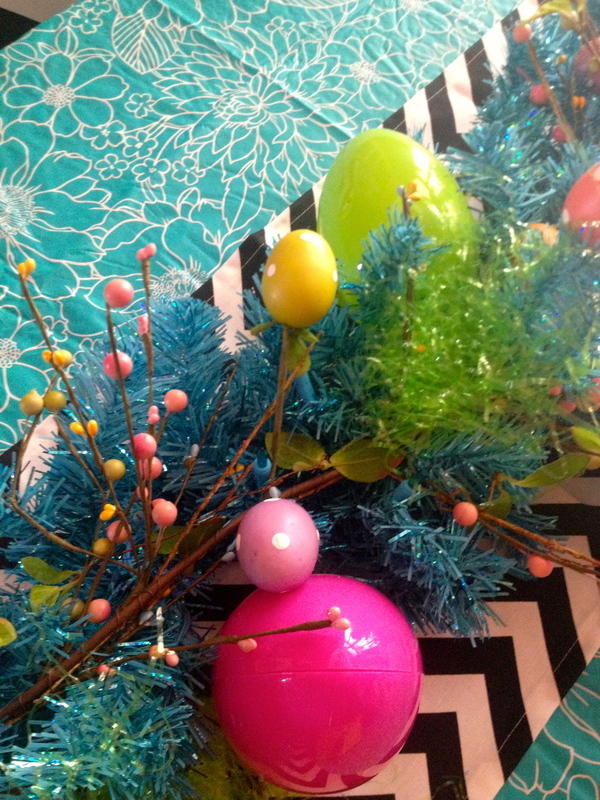 The Easter egg garland is a great hand wrapped wired garland, easy to shape out and attach to the blue garland by twisting the greenery over in several places. 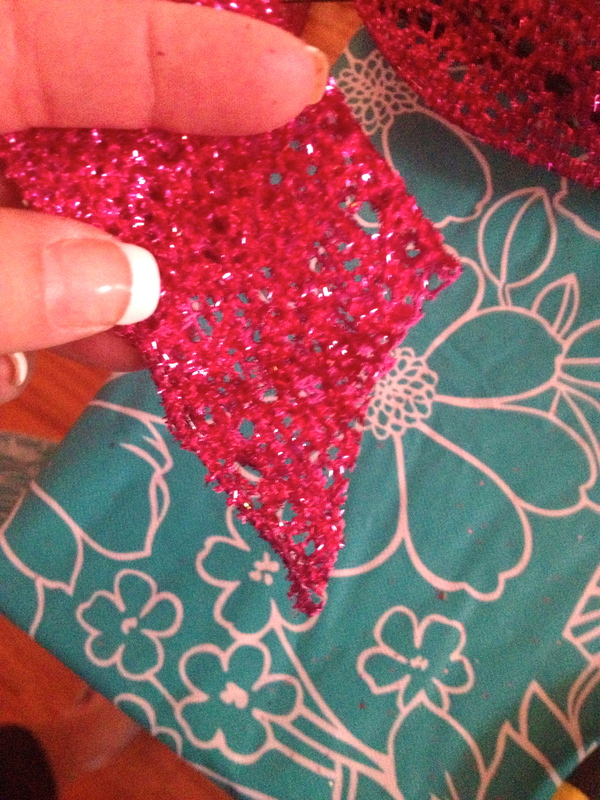 (no hot glue gun needed). 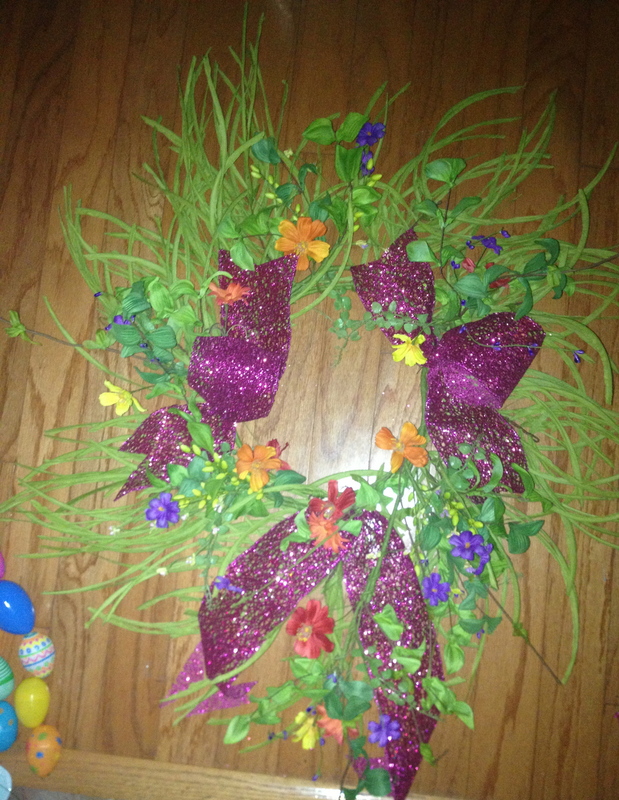 The 5′ Easter garland was centered in the middle of the 9′ blue garland. 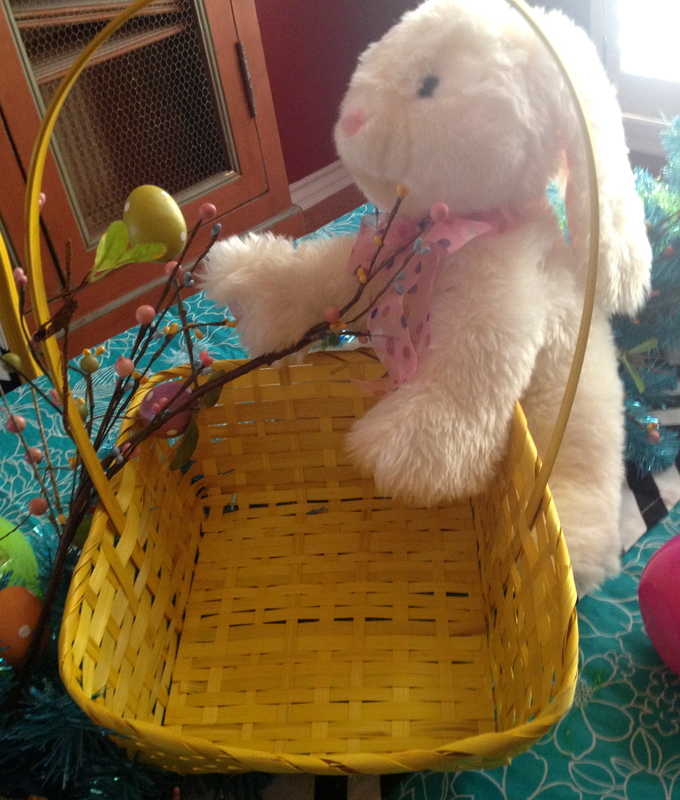 After a quick trip to Walmart for new plastic Easter eggs and grass After securing the two garlands together it was time to add a focal point, Rebecca’s Easter bunny and a yellow basket. 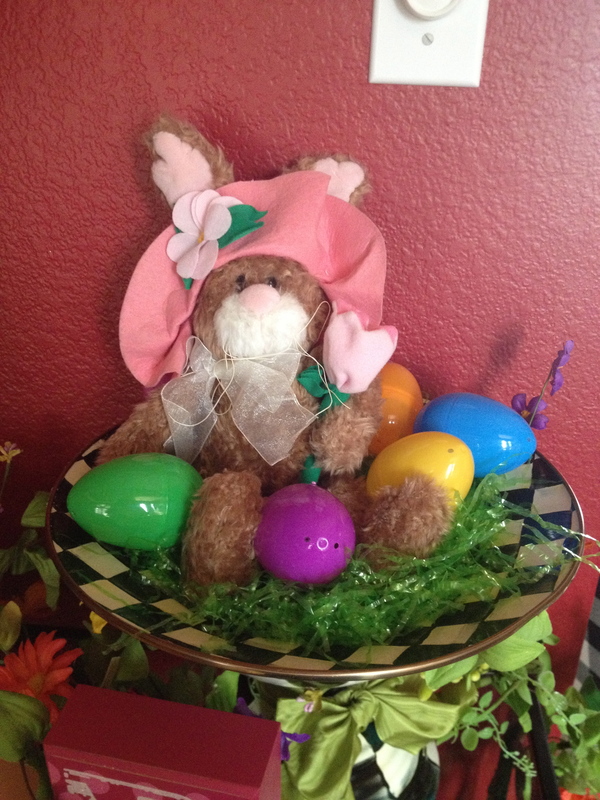 I used the garland greenery and Easter garland to wire on the bunny and basket. 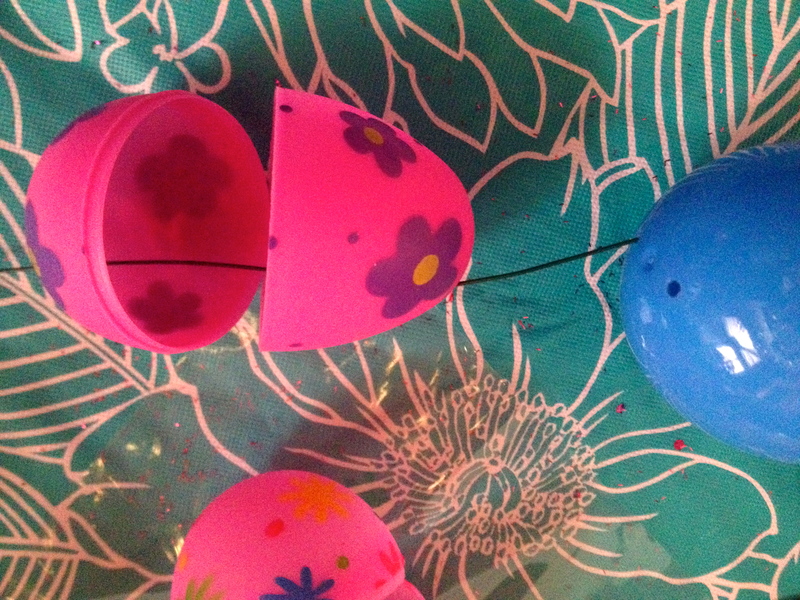 Now it’s time to fill the basket with an assortment of plastic Easter eggs, different sizes, colors and patterns. 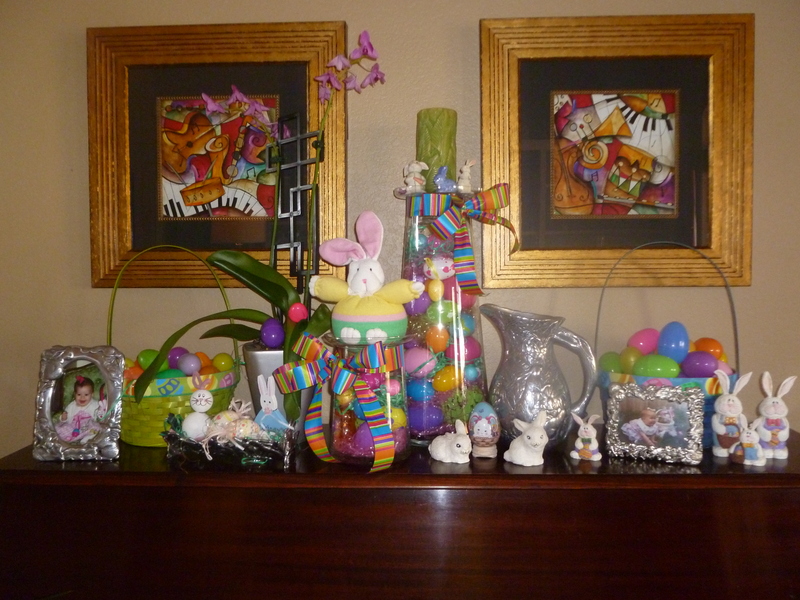 I also tucked in a few eggs to the garland. 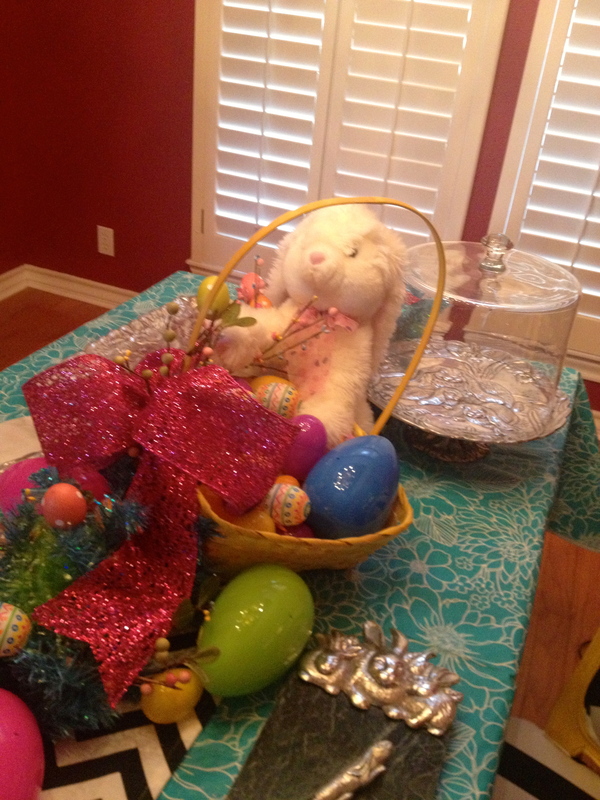 The Easter basket is ready to be filled. 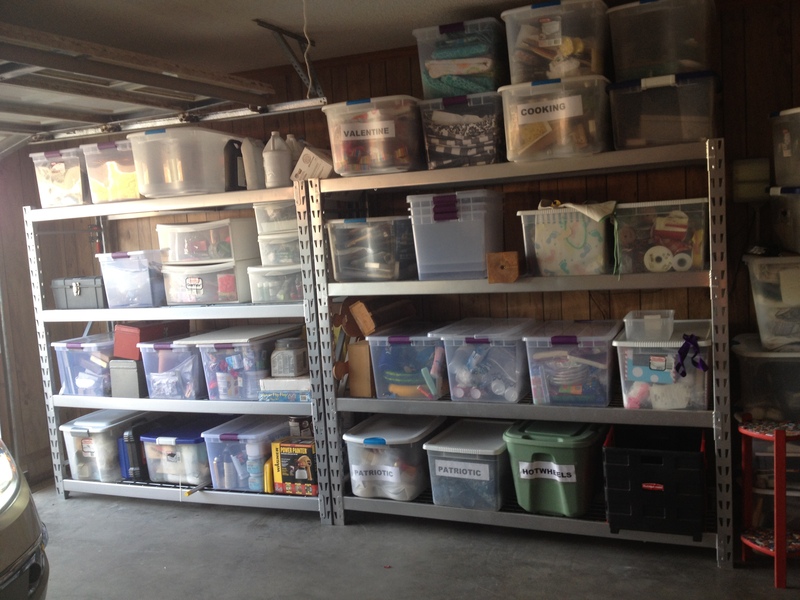 use and assortment of, colors, sizes and patterns. 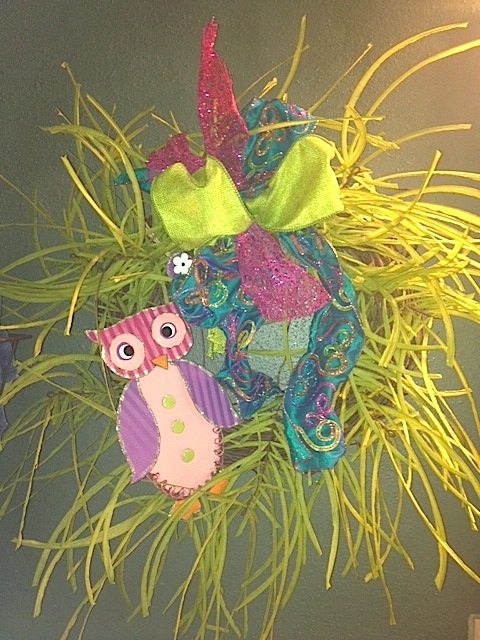 Green Easter grass is an inexpensive addition to the garland and I chose orange for the basket. 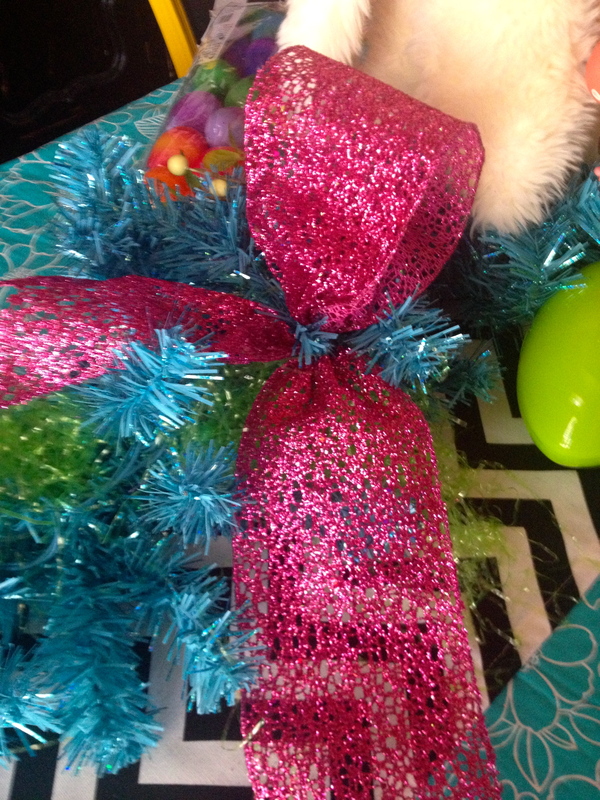 Green Easter grass tucked into the garland. Create a single loop bow and wrap wire to hold. 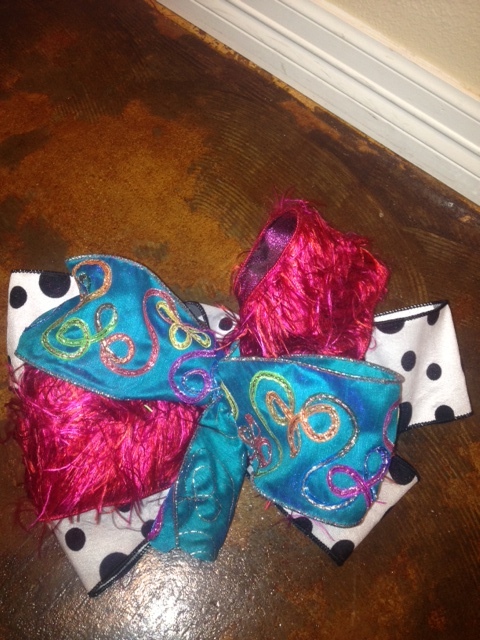 2 yds makes a 2 loop bow, secure with floral wire. 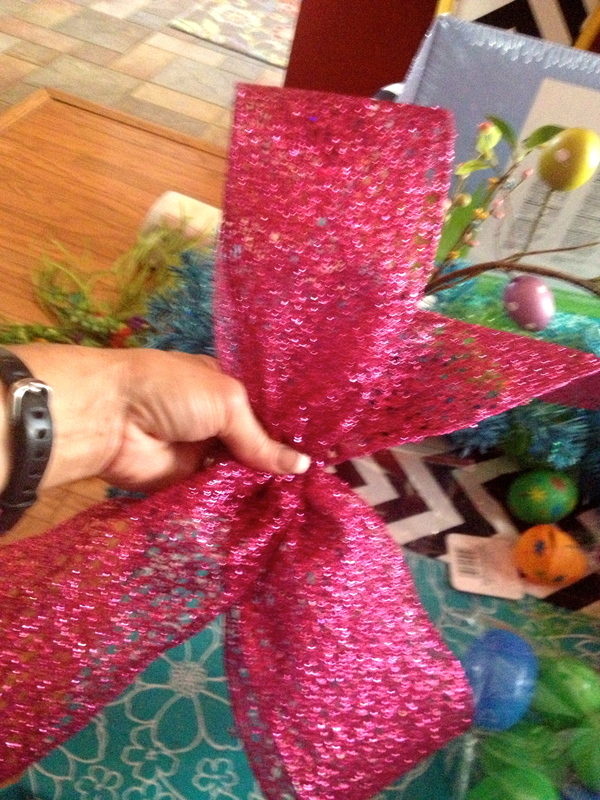 Attach a single loop bow on each end of the garland and the 2 loop bow by the Bunny and basket! A collection of Bunny Author Court (given to all the Grand daughters by the original Miss Cayce’s) is ready for an Easter party! 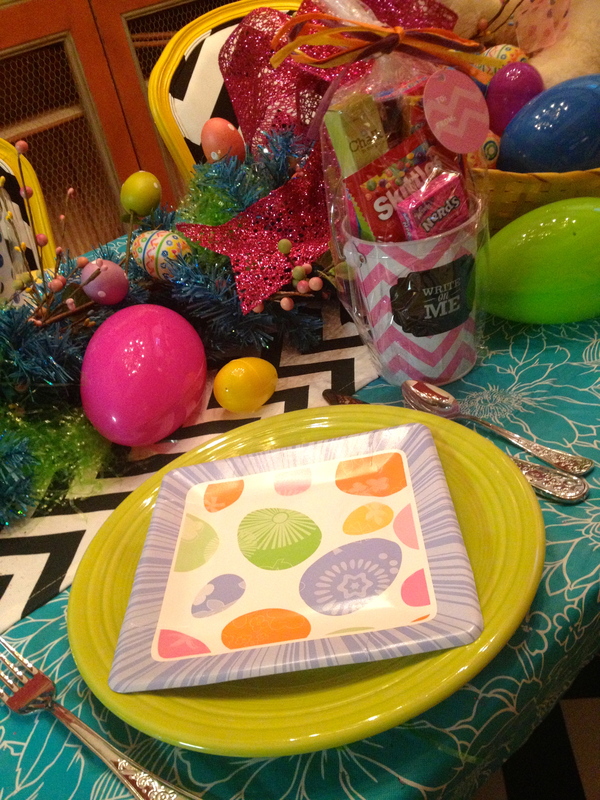 A quick change out to bright #Fiesta plates as chargers & paper Easter plates and napkins we are ready for a fun lunch with family or friends. 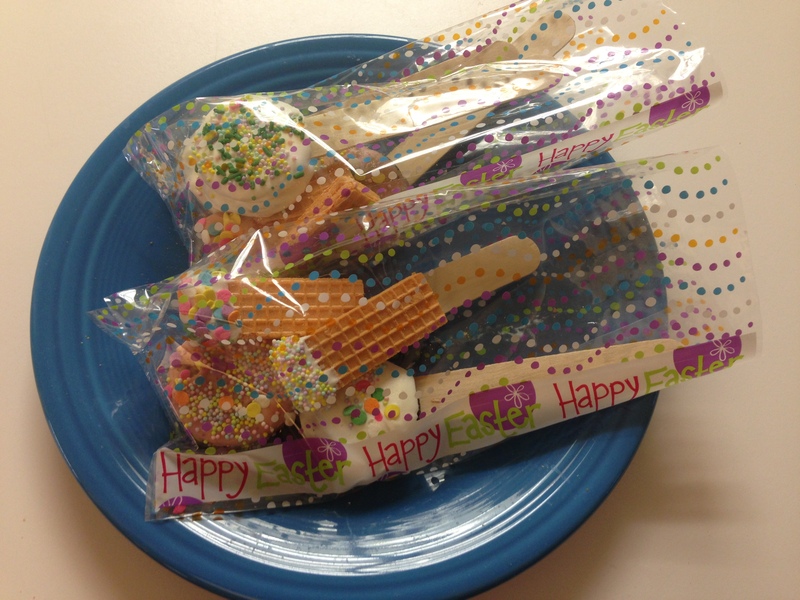 While shopping at Sams I spotted these fun Easter bucket treats ready to personalize and send home with guests! 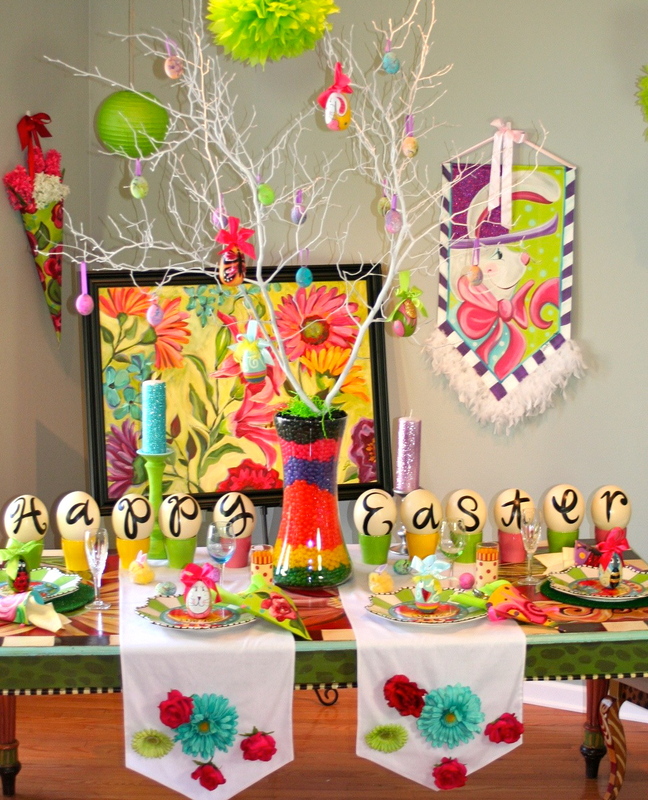 This bright and cheery table scape celebrates Easter, the Season of Hope! 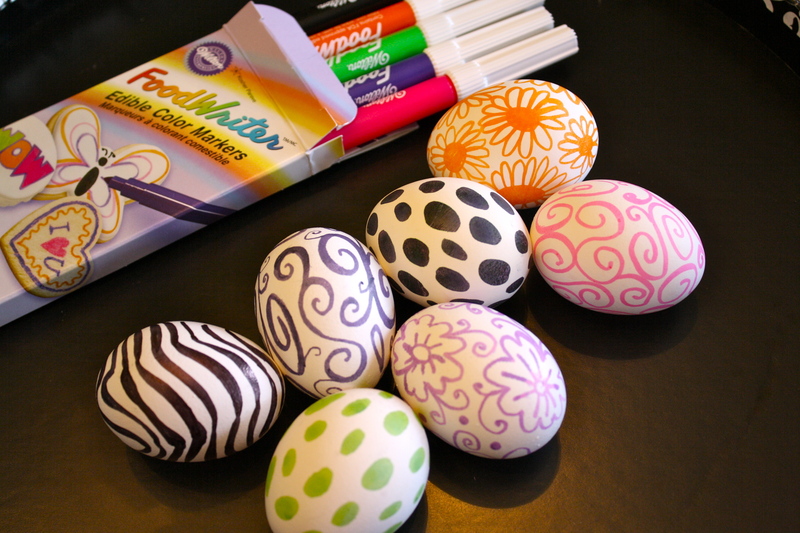 Show Me Easy Easter Simplicity! 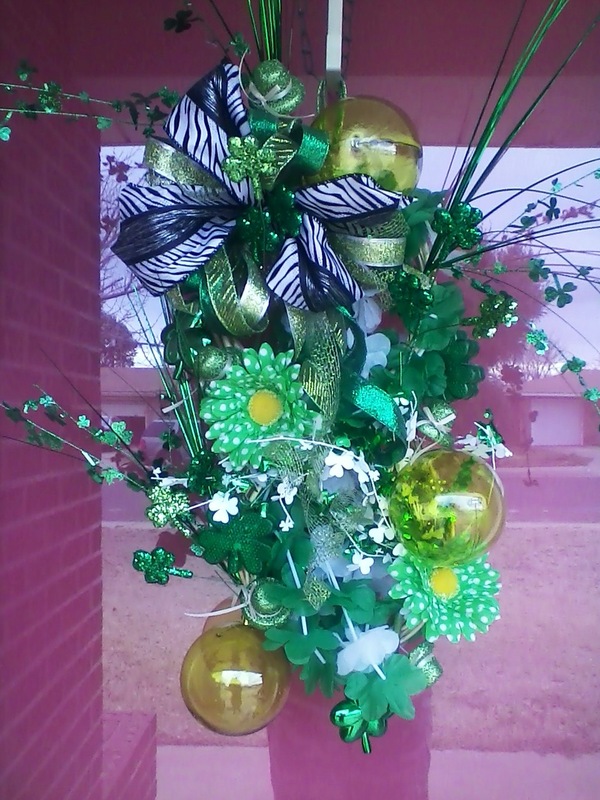 I love to create and make arts and crafts projects, painting, papers,florals etc. However with my busy lifestyle the DIY doesn’t always get done. 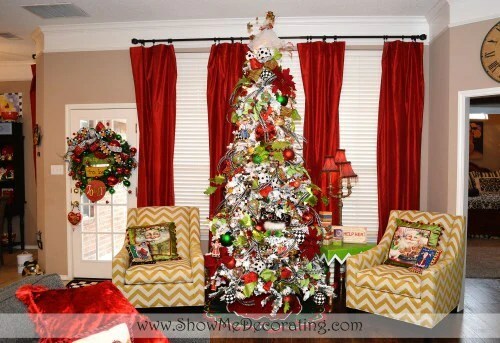 So I choose to decorate with all the great product that is ready made! 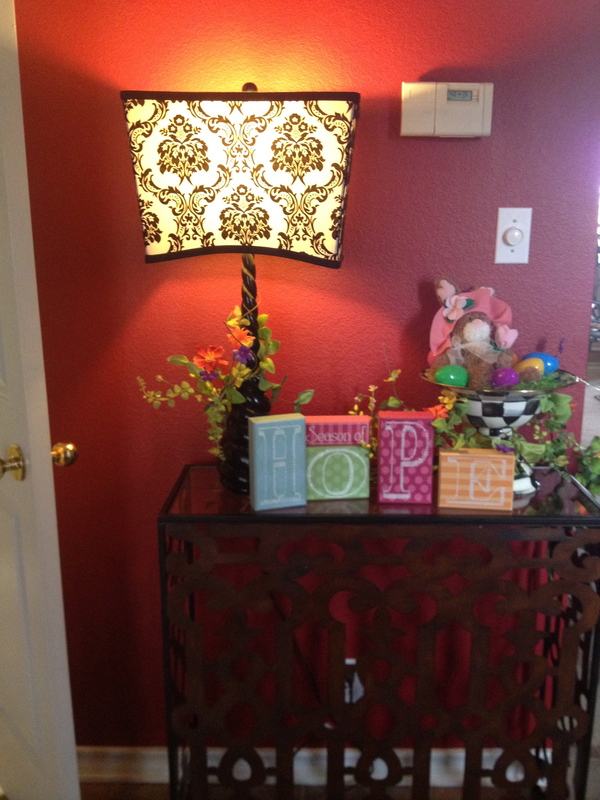 Happy Easter display greets visitors and guest! 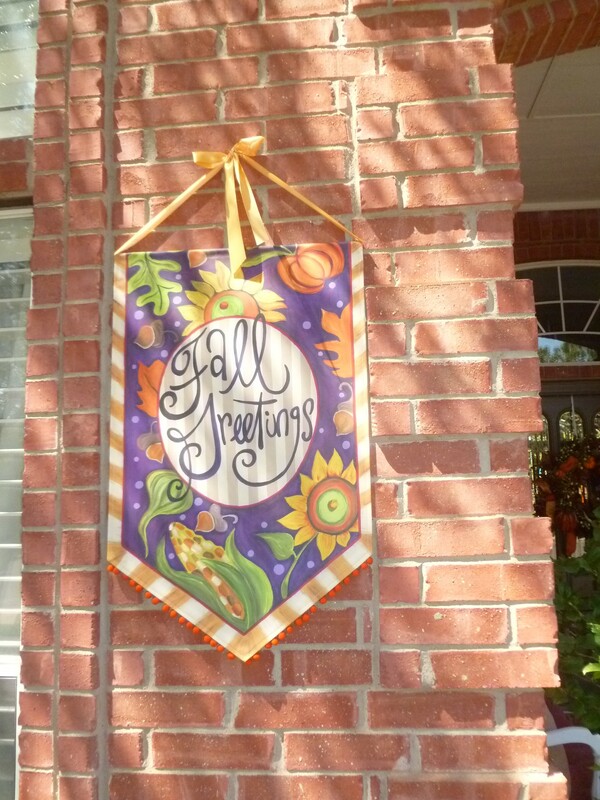 Finding a location in your home to change out and decorate seasonally is key! A front entry table, fireplace mantel, shelf, kitchen island or buffet, choose an area you and your family will enjoy! 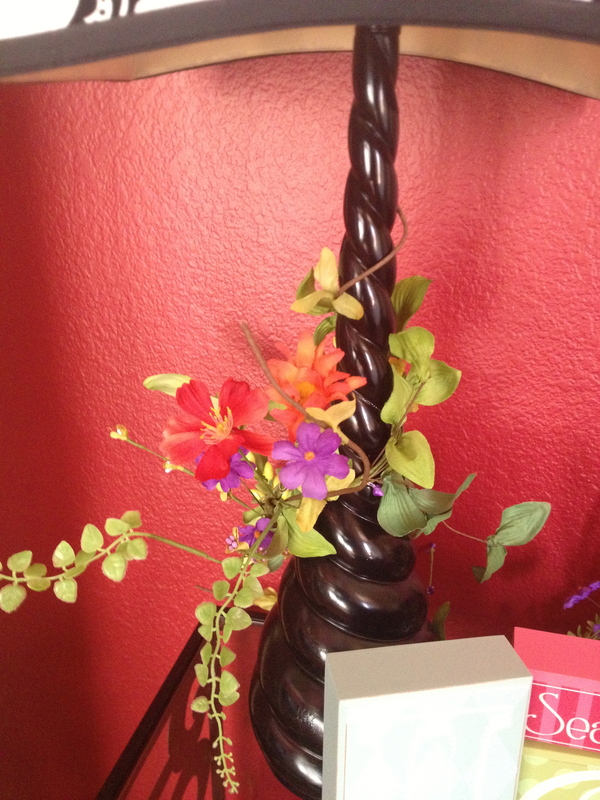 Floral: Bright Multi Flower Garland 5′ long, this is a wired and wrapped garland that shapes out and stays where you put it! 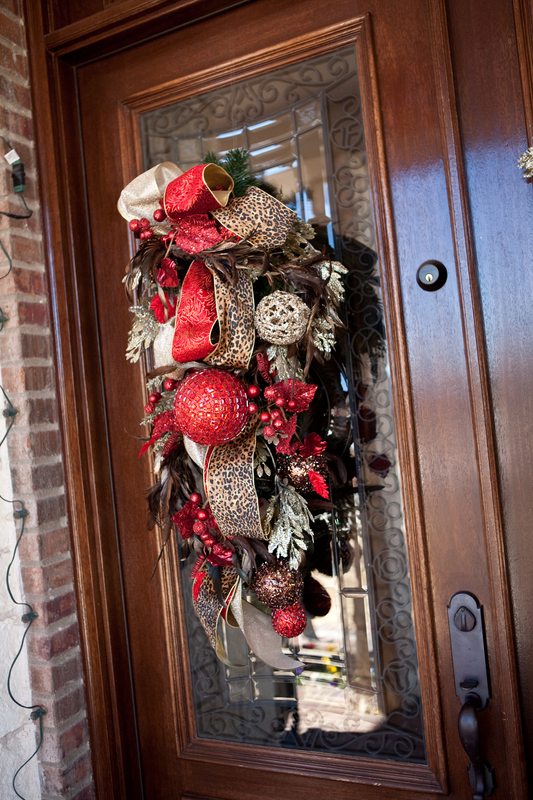 Be sure and shape out your wired garland, see how much it opens out and how full it becomes! 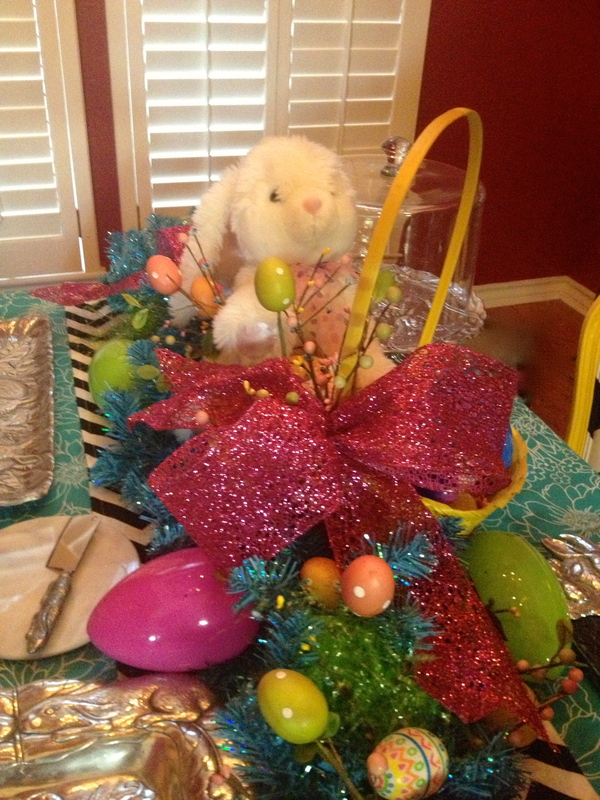 Rebecca’s favorite #Easter bunny nestled in #MacKenzie-Childs dish. At this point I felt like it needed something…. and ribbon was the answer! 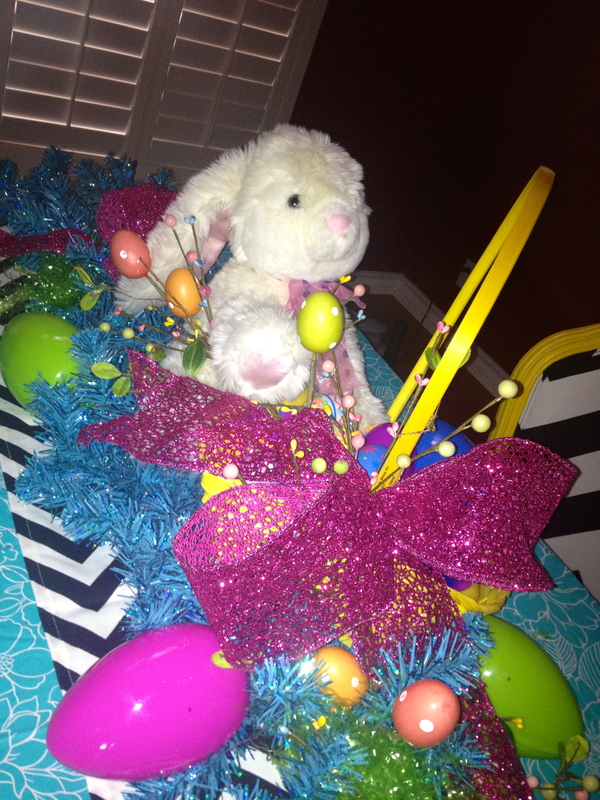 The green ribbon is a great balance and adds a brightness to this fun Easter display! Easter is truly a Season of Hope! The silver cross signifies the risen Savior we celebrate! For your Easter family celebration, here is a family favorite dish at ours! Mix peas, cream of mushroom soup and milk, stir in salt and pepper. Melt stick of butter, slice bread in 2 inch strips or thirds. Layer asparagus on bottom of a 9×13 dish sprayed with Pam, then sprinkle chopped water chestnuts over asparagus, spread on soup mixture, sprinkle cheese over top. Dip strips of bread in butter, lay on top of cheese to completely cover, bake at 350 degrees for 30-45 min until completely heated and bread is toasted! Wahoo! 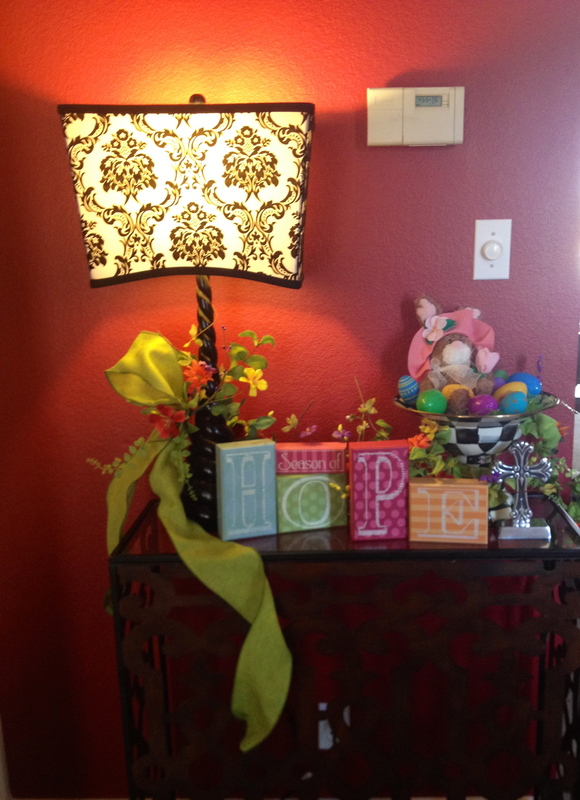 Lisa Frost is hopping onto the Show Me Decorating radio show. Listen in to hear what this fun, funky and talented artist is up to these days. 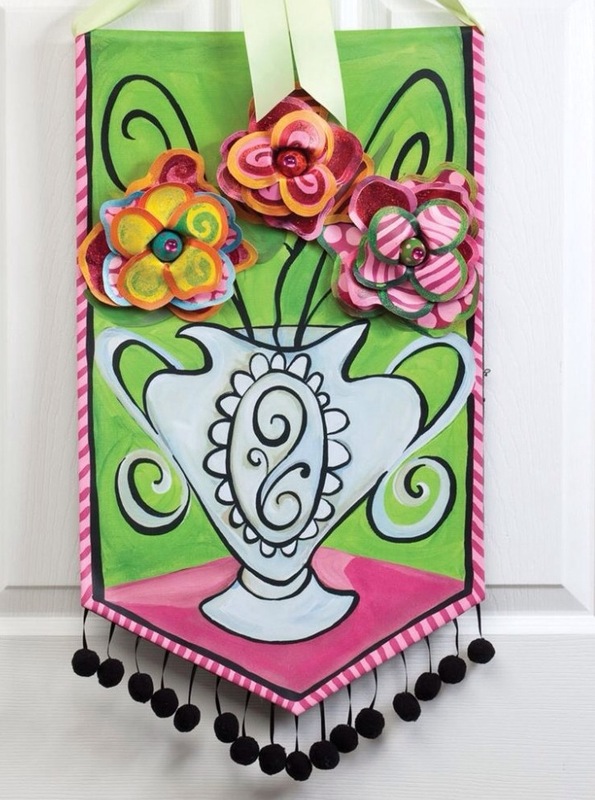 We will get the inside scoop on Lisa as an artist as well as her tips for Easter. 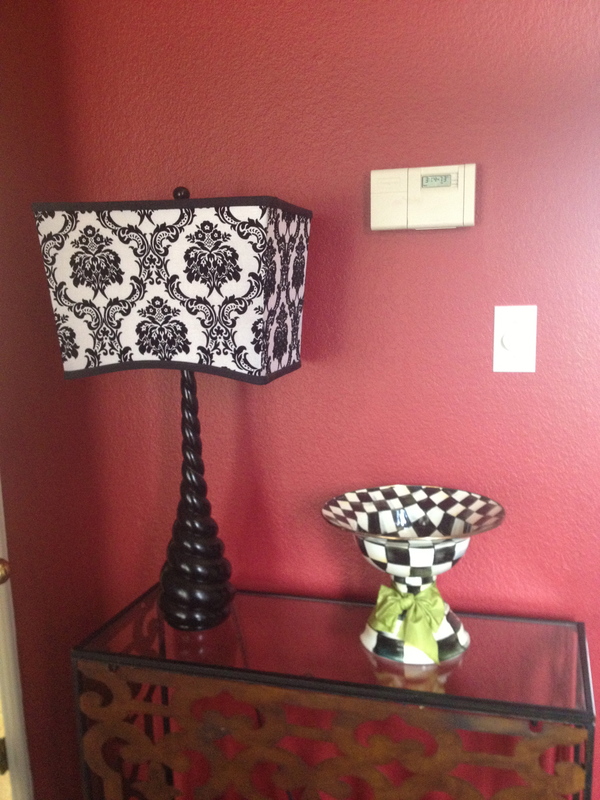 Here is one of the ways we use Lisa Frost’s designs to inspire you. 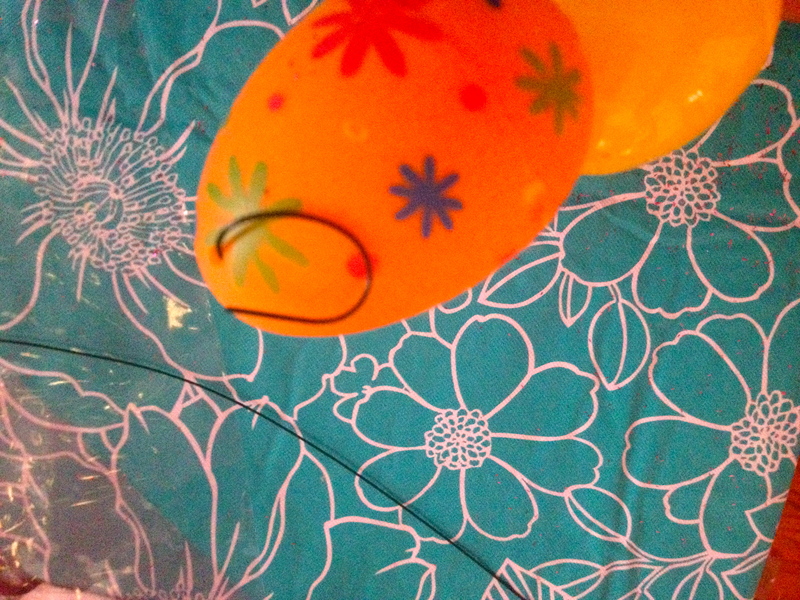 We love to use fun colorful wired ribbon. Won’t the Easter bunny love this Welcome when he comes to deliver the Easter Eggs! 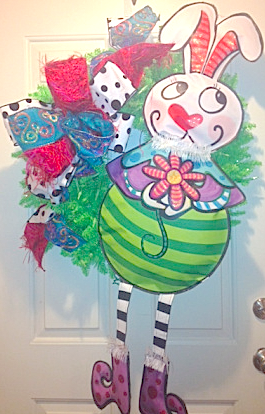 If you like what you see, hop on over to http://www.showmedecorating.com and see the Merry Spring and Easter collection for wreaths, ribbon, and spring or Easter signs! Will Your 1st Impression, Open or Close Doors? You never get a second Chance to make a 1st Impression! You CANNOT, NOT make a first impression. People always form an initial impression about us, our homes, our offices, our businesses the 1st time they come in contact with us, in person, over the telephone or at our front door. The experts differ on the number of seconds it takes to create a 1st impression, but between 7-17 ! Vision leads the pack of our senses used to make a first impression, smell is second. 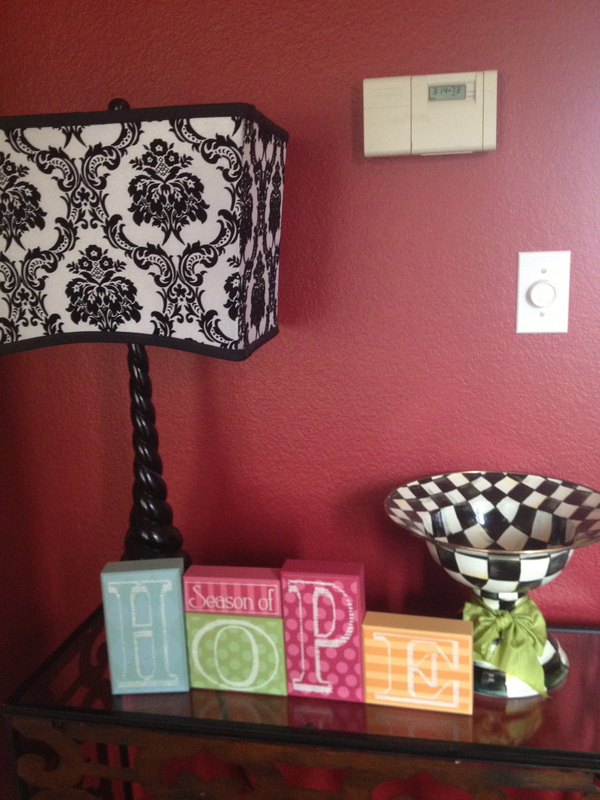 Did you know Show Me Decorating has a radio show? 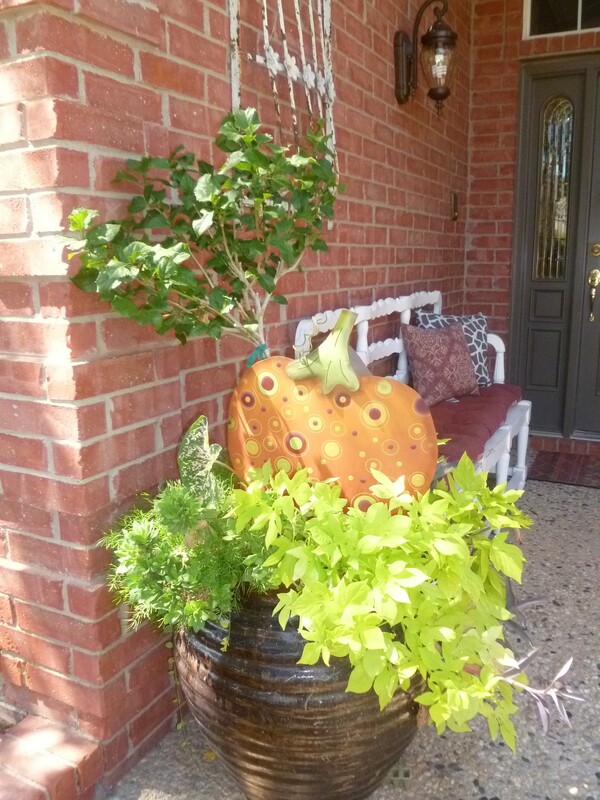 My bench with fall cushions, new fall wreath on the front door, notice the lime green berries that coordinate with my color scheme! 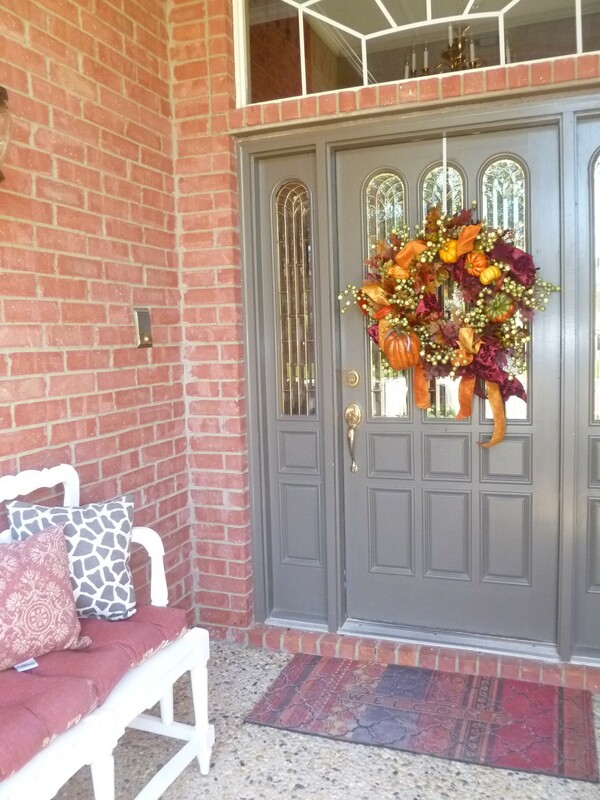 A bench, chairs, pillows, and rugs allows you to treat your front porch like an outdoor room. Leave plenty of access and don’t overcrowd. Everyday- coordinate with the color of door, house trim and brick. 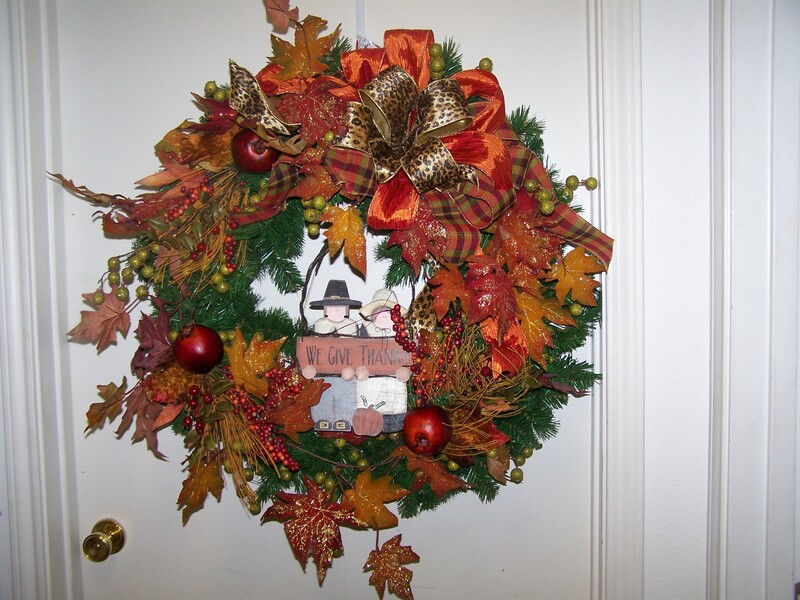 make sure the wreath or door piece is proportionate to the size door. step and view from the street. 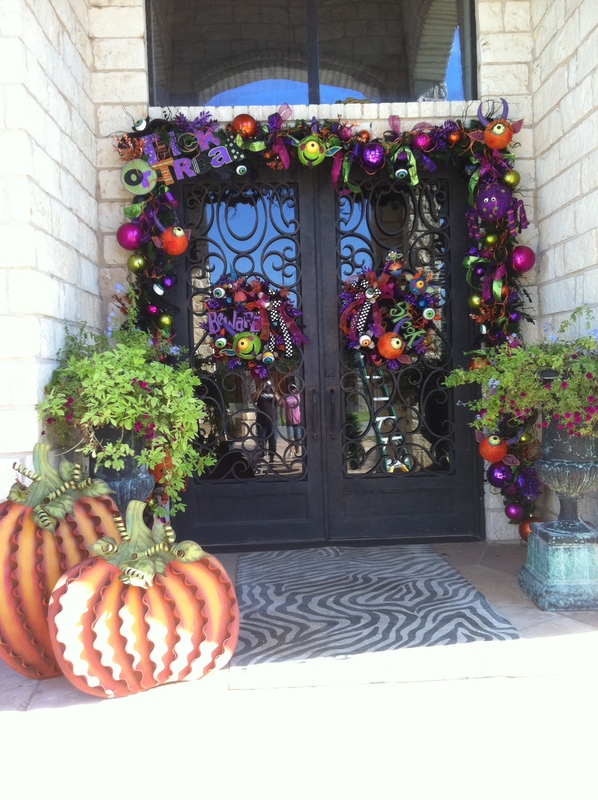 Fall/ Halloween- many wreaths and door pieces can be created to change from fall to Halloween and back to fall. 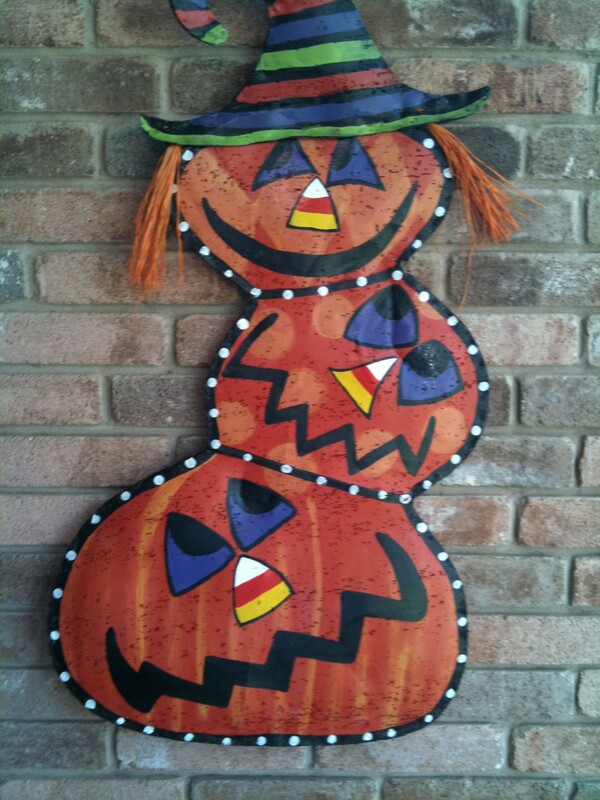 adding some spooky is fun for trick or treaters. 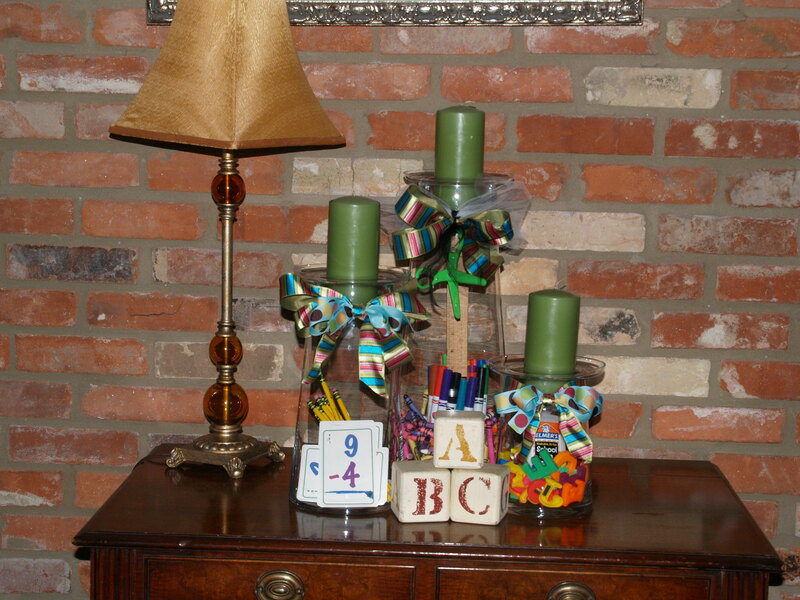 celebrate the beginning of fall and school starting with a decoration made from school supplies! 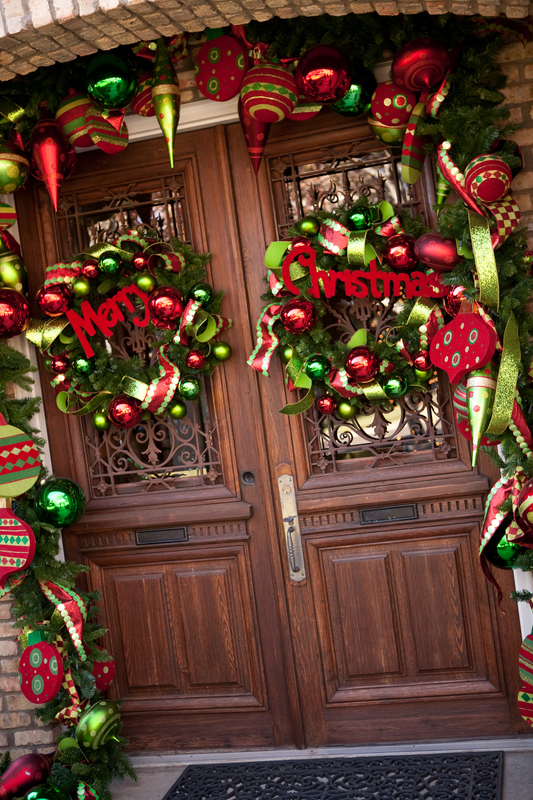 Christmas –this is the time to go all out! 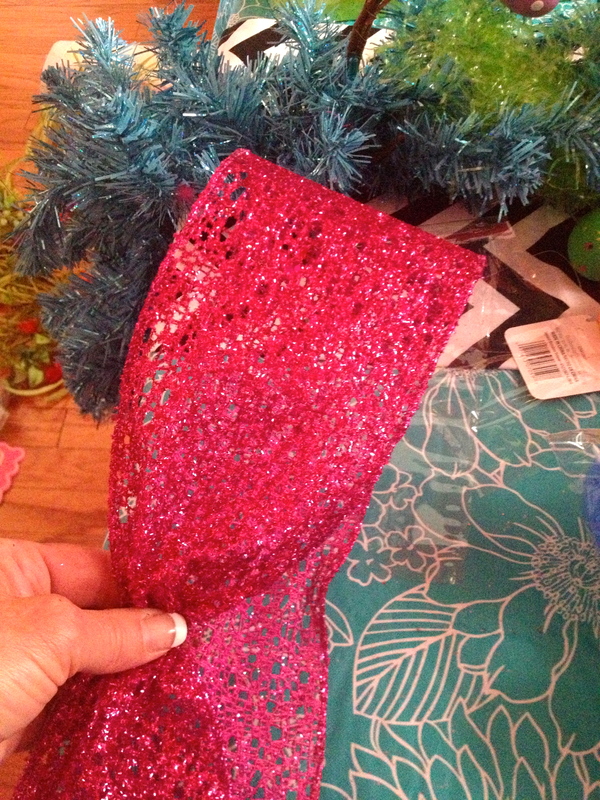 add the sparkle and shine! 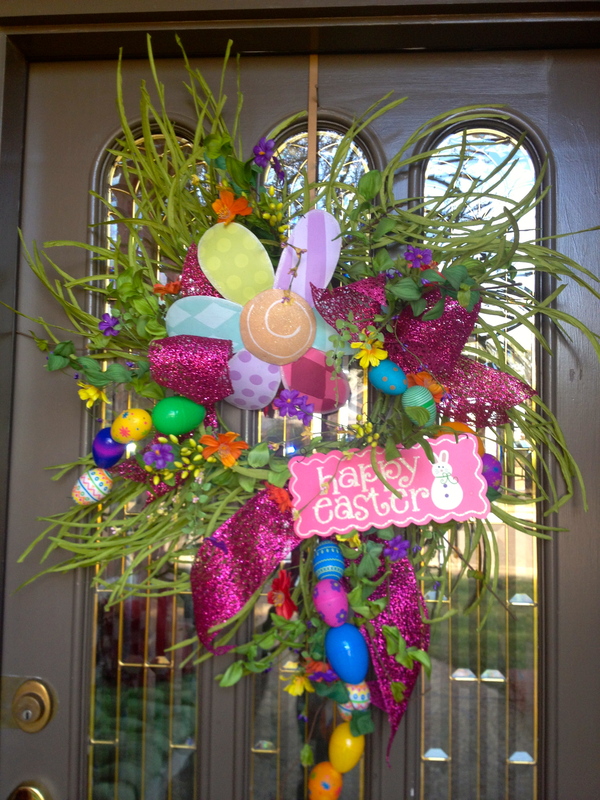 Easter/ Spring- bright greens (St. Patricks Day) are a welcome sign after a cold winter, easter grass and easter eggs, complete with a basket and bunny can make a welcome entrance way! 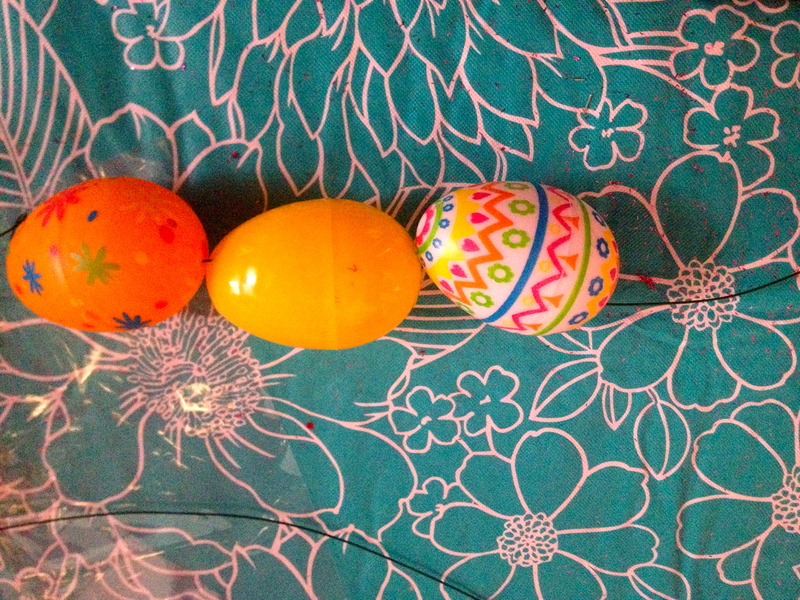 This Egg-tra special display celebrates Easter!